With a dramatic outing of 161, Paolo Nebrida clinched his 3rd National Title in the recently concluded 150K Bantayog Festival in Daet to crown himself as the 21st National Master. 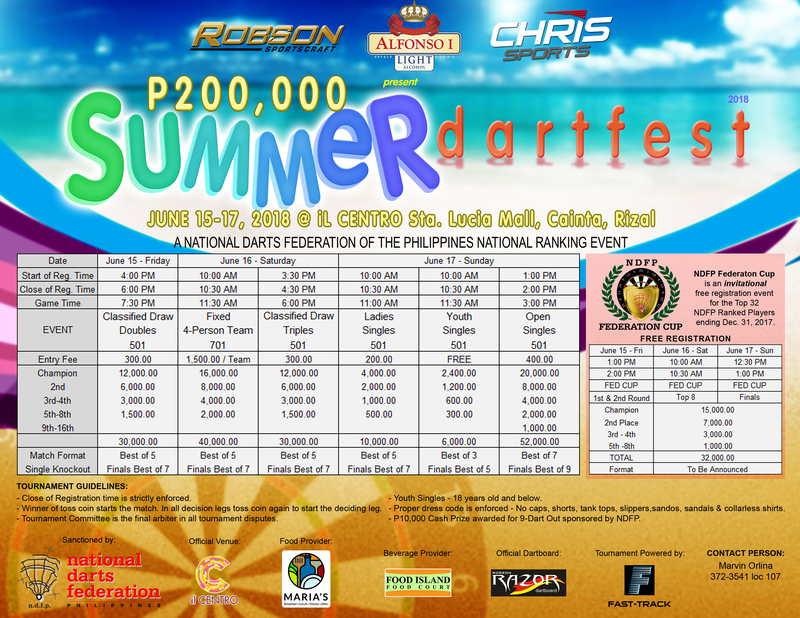 Christian Perez of Robson-Koronadal earned 198 ranking points and leads the 2019 Chris Sports Darter of the Year Award after winning two (2) of the seven (7) National Ranking Tournaments (100K and over) in the 1st Quarter of 2019. Perez won the 100K Kalilangan Festival in Gensan and the 120K Kaamulan Festival in Malaybalay, Bukidnon; placed 2nd in the 150K Hinugyaw Open and landed T16 in the Philippine Open. Perez is regaining his form that propelled him as the CS Darter of the Year in 2014. 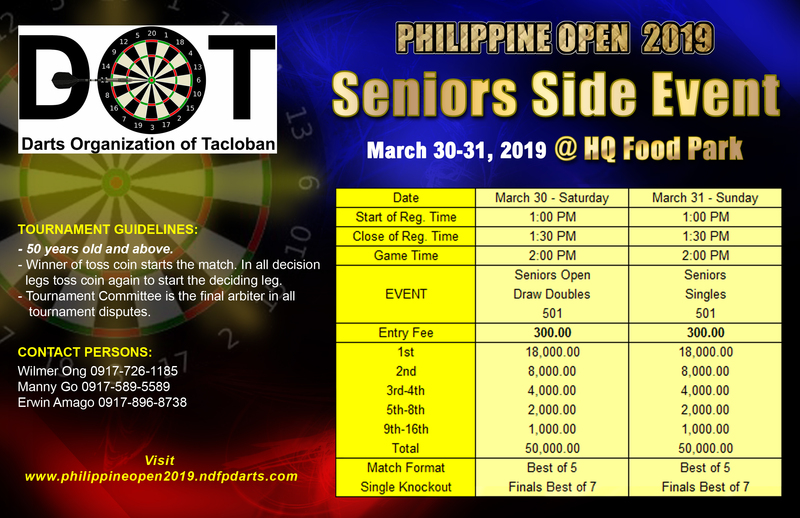 The “Philippine Open 2019 – 7.5M International Darts Championship” (PO19) takes center stage as the biggest Philippine dart tournament, to date; back to back with the PDC Asian Tour 5 & 6, the leading steel tip dart series in Asia, with a cash prize in every tour of USD 10K (P520K). 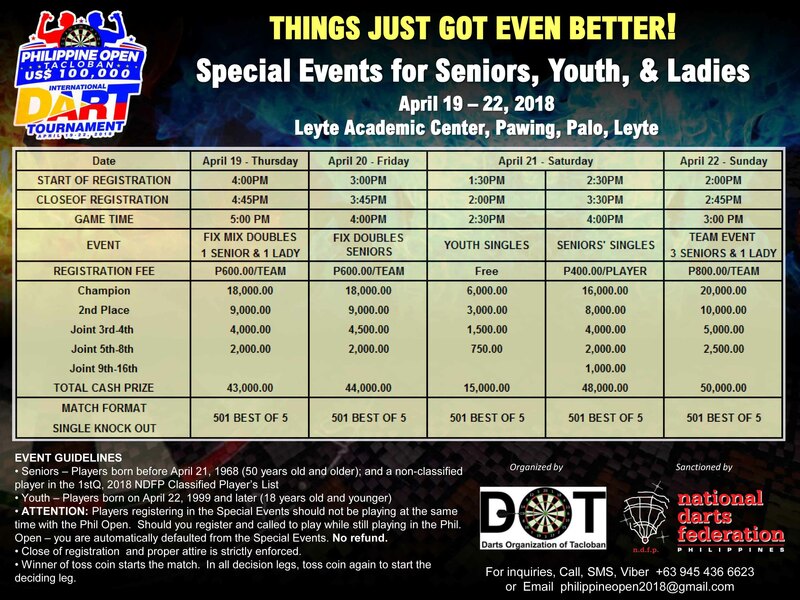 This historic breakthrough in Philippine darts is set for March 28-31, 2019 at the fully air-conditioned Leyte Academic Center in Palo City, Leyte with a total cash prize of 8.5M. Noel Malicdem of Robson-Pasig continues to maintain the top spot of the NDFP National Player ranking in the last 7 quarters since the 2nd Quarter of 2017, and remains to be the only player to earn more than 1K ranking points. John Ray Sajol of Malaybalay, Bukidnon joined the elite group of NDFP National Masters after winning his 3rd NDFP National Open Singles titles: the 100K Sen. Manny Pacquiao Birthday Singles last December 16, 2018, the 100K Brgy Apopong Festival in September 2017, and the 100K Pagsalabok Festival in May of 2018. Michael Viola of DOT-CDO is the 2018 Chris Sports Darter of the Year Awardee. Viola won six (6) Open Singles, the most number of championships won by any player in 2018. Though all championship came from Mindanao he gained ranking points from 22 Open Singles events nationwide. Viola won the first ranking event in 2018, the Hinugyaw Open in Koronadal City, for his 3rd National Tile and earned the National Masters Title. He closed 2018 winning the Huling Hirit last December 27 in Davao City. Michael Viola of DOT maintains a slim lead for the 2018 Chris Sports Darter of the Year Award. Team mate Lourence Ilagan is only 20 ranking points behind, and is rapidly closing in on Viola after winning 3 Open Singles in the 3rd Q: the 650K Casino Filipino Pukulan sa Tagaytay, and the 2 Open Singles of the 425K Kadayawan Festival. The six cities with 12 stages of the PDC Asian Tour 2018 came to a spectacular close with the PDC Tour Manila held at the Ballroom of the Crowne Plaza Hotel last October 13th and 14th, 2018. NDFP President Tito Soncuya and Cong. Florencio "Bem" Noel mutually agreed in principle to sustain, expand, and enhance the booming domestic growth of Philippine darts and at the same time, achieve a higher level of international participation, exposure, and competitiveness. Donjem Dimaculangan of Robson-Lucena City joined the elite group of National Masters after winning his 3rd National Title in the 200K Tinalak Open Singles last July 15, 2018. The 2018 Darter of the Year Award is a wide open race after the 2nd Quarter of 2018. 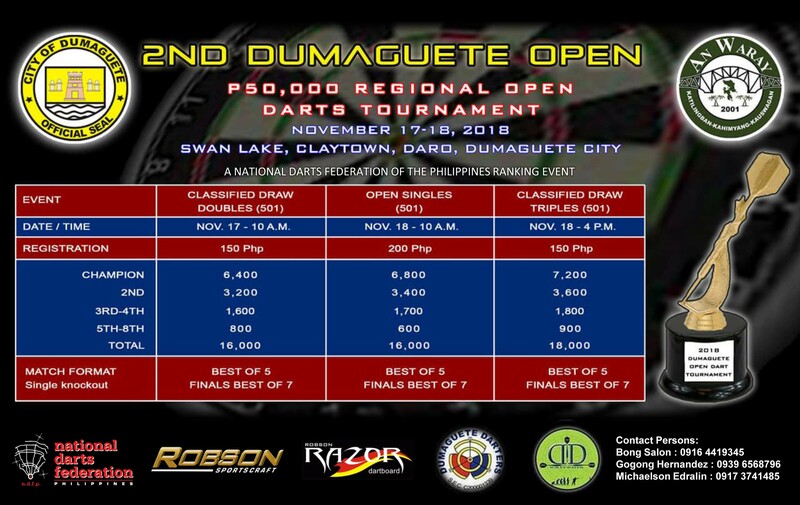 This is the quarter with a remarkable breakthrough of P7.4M in total cash prize in a record 16 NDFP Ranking and Sanctioned tournaments. 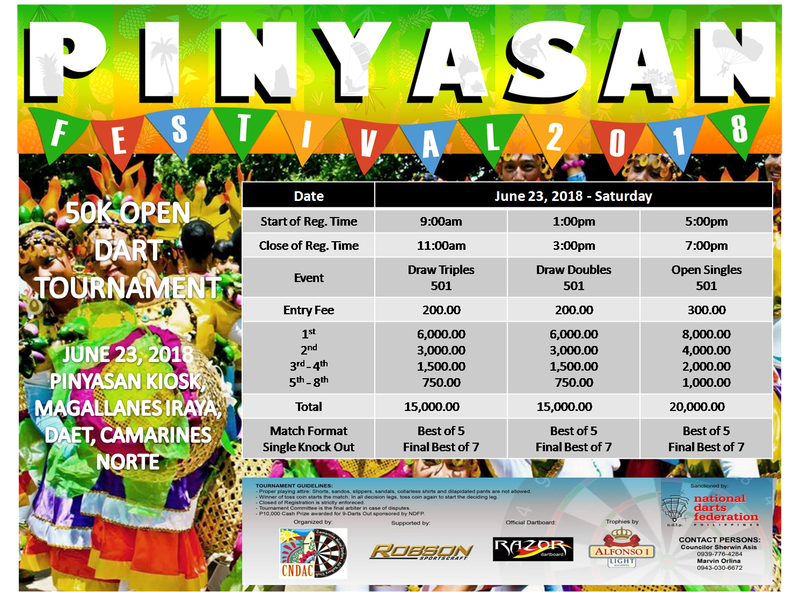 The 2nd Q is unprecedented in the history of Philippine darts in the magnitude of the cash prize offered, and the number of ranking tournaments organized on a national scale in Luzon, Visayas, Mindanao, and the NCR. Lourence Ilagan of DOT-Gunner regained his deadly form to win the 2018 NDFP Federation Cup in Sta. Lucia Mall last June 17, 2018. Ilagan overwhelmed Donjem Dimaculangan of Robson with 3-0 straight sets win in the best of 5 sets - best of 7 legs championship match with a tournament highlight of 96.96 dart average. 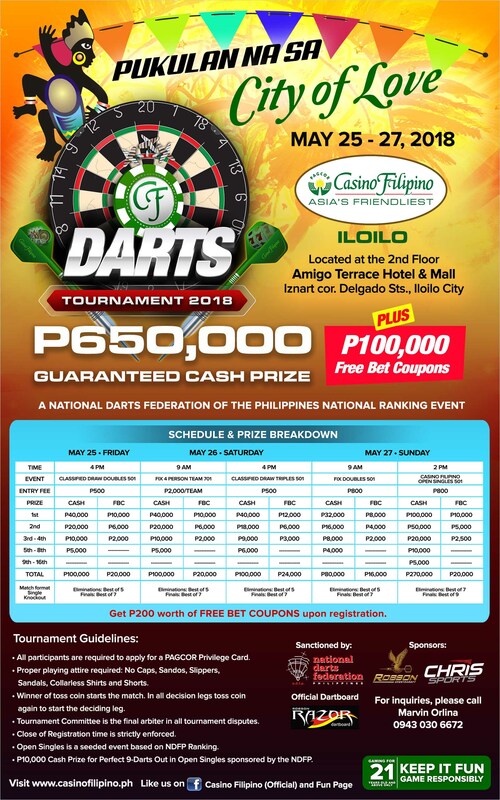 The 2018 Summer Dartfest, held at the Il Centro, Sta Lucia Mall last June 15-17, 2018 was highlighted with an exceptionally large participation of players in all events. The Classified Draw Doubles registered 260 players, Draw Triples with 252 players, Fix 4-Person Team with 216 players and the Open Singles with 155 players. The event organizer, NDFP, graciously extends its appreciation and gratitude for the overwhelming support for the 1st NDFP Ranking tournament in the National Capital Region this year. Nine-darter Noel Malicdem defends the prestigious Federation Cup against the Top 32 players of the Federation National Player Ranking ending 2017. 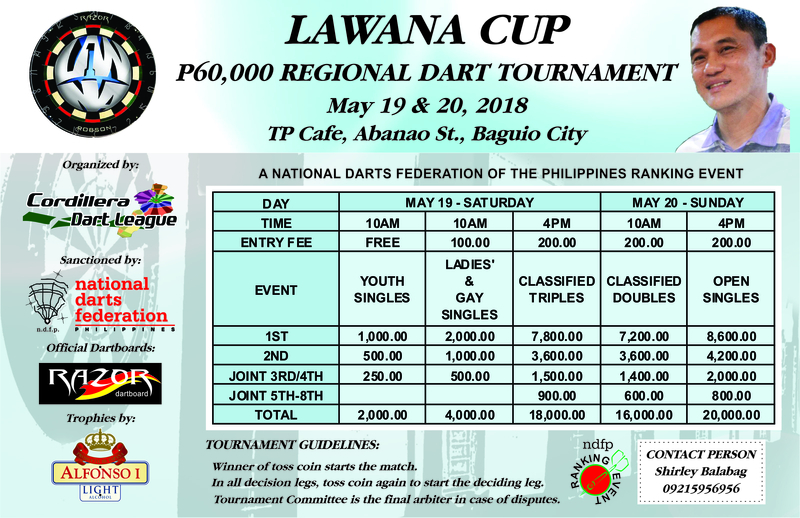 The 2018 Federation Cup will commence during the 200K Summer Dartfest on June 15-17 at the Il Centro, Sta Lucia Mall. 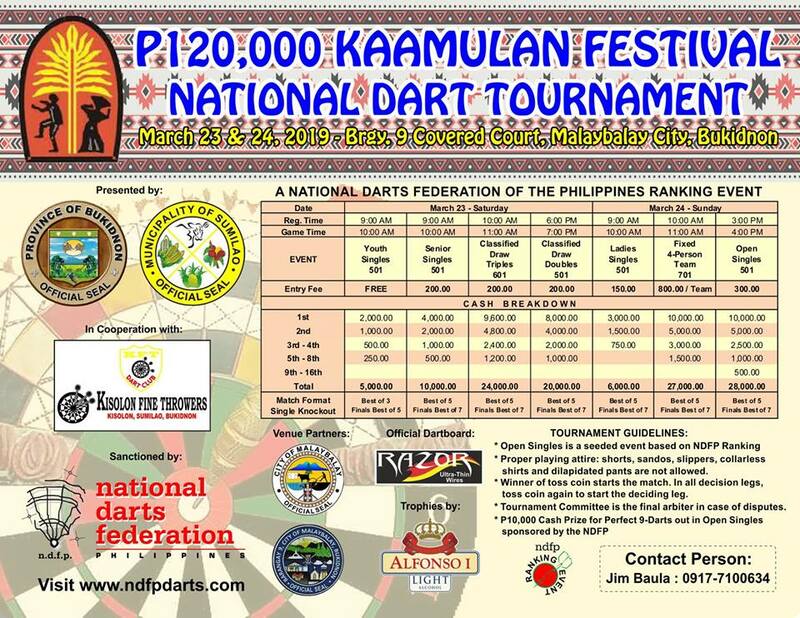 The National Darts Federation of the Philippines (NDFP) reached another milestone. 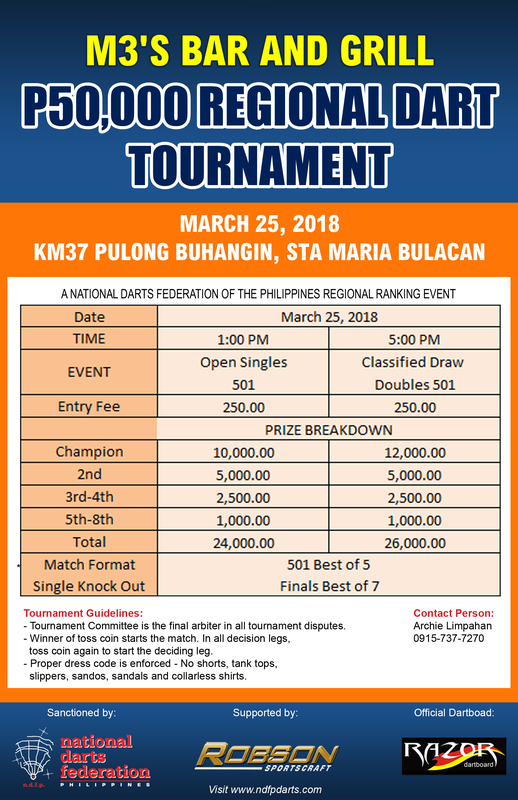 Ending March 2018, the NDFP Ranking and Sanctioned Tournaments reach a grand total of 78 Open Singles Tournaments nationwide. This is the most number of ranking tournaments ever in the history of Philippine darts in a 2-year Rolling period (April 2016-March 2018). Engineer Arturo “Long2” Longyapon of Davao City is the 18th National Master winning his 3rd National Singles Title in the 100K Kalilangan Festival in General Santos City and following his championships in the 200K Pacquiao Birthday Tournament in Dec 2017 and the 100K Tacurong Open in 2013. Michael Viola of Cagayan de Oro won four (4) Open Singles championships in the 1st Q to lead the 2018 Chris Sports Darter of the Year with 182 points. Winning four (4) of the eleven (11) tournaments was very impressive with no other player winning more than once in the 1st Q.
Noel Malicdem, the NDFP top ranked player and back-to-back Chris Sports Darter of the Year in 2016-2017, stunned the darting world with a perfect 9-darts finish in the PDC Asian Tour held in Seoul, Korea last March 10, 2018. The organizers did not expect a 9-darter to happen in the Asian Tour so no cash prize was provided. With his 9-darter, Malicdem defied all odds and expectations. The PDC Asia Tour begins this weekend, March 10-11, in Seoul, Korea for the Asian Tour Order of Merit, which will determine the “top 4 players who will qualify for the 2018/2019 World Darts Championship in Alexandra, London” and “to select players for the 2018 World Cup”. Ending the 4th Quarter, 2017, we saw three (3) new Regional Top Players. In the Calabarzon-Mimaropa Region, Malaysian Open 2017 Champion Donjem Dimaculangan of Robson displaced long time top Regional player Lourence Ilagan of DOT Gunner for the top spot. Noel Malicdem of Robson - NCR remains as the top Philippine Ranked Player since the 2nd Quarter of 2017. Malicdem, the Chris Sports Darter of the Year for 2 consecutive years, enjoys a huge 264 points lead over 2nd placer DJ Toncopanon of Robson – Gensan. A virtual unknown in the national ranking circuit is the latest addition to the roster of the NDFP National Masters. Congratulations, Michael Viola of Cagayan De Oro City, who earned the National Masters title in 3 short months since winning his first title at the 100K El Dardo Tournament - Zamboanga City in October 2017, then at the 200K Manny Pacquiao B-Day Tournament in December, and finally for his 3rd title at the 100K Hinugyaw Open in Koronadal City, January 8, 2018. Congratulations, Gilbert “Bhoy” Ulang of Team Julios, the latest NDFP National Master. Ulang won the Open Singles of the 650K Casino Filipino Manila Bay Series last December 3, 2017 - his 3rd national open singles win to earn the NDFP National Master title. Congratulations to the new National Master, Alexis Toylo for winning his third National Open Singles in the recently concluded Darterong Pinoy 2017. He joins the elite group of the 15 Philippine National Masters since 2005. Alex Tagarao is the new Masters Cup Champion after beating the defending National Masters Cup Champion and last year’s Darter of the Year Awardee, Noel Malicdem, 3-1 sets, in the best of 5 sets best of 7 legs championship. 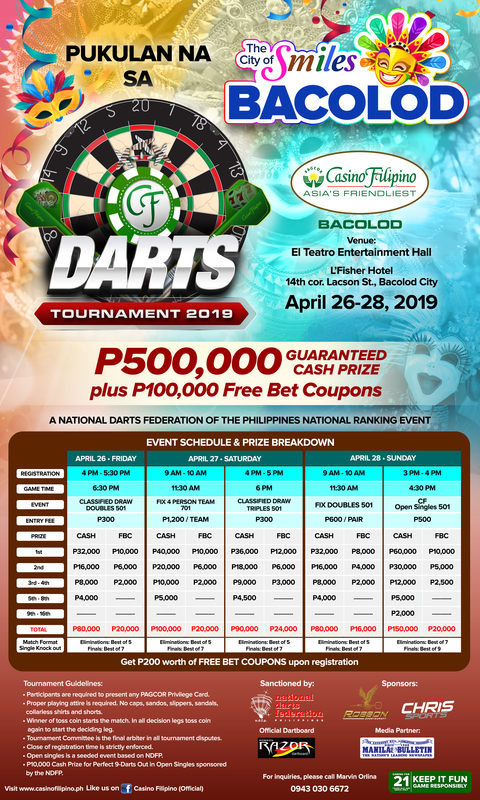 The National Darts Federation of the Philippines recently concluded the 200K Free Registration Darterong Pinoy 2017 in the midst of the magnificence and splendor of Winford Manila Resort and Casino last October 27-29, 2017. It was a luxurious setting never before seen in Philippine darts. For 3 days, over 600 players and guests were seated comfortably, treated with the full service of the hotel Food and Beverage staff underneath the glittering chandeliers that lit the place. It was an impressive setting for an exceptionally historic tournament - the longest running annual dart tournament and the biggest free registration dart tournament ever. It was a celebration of camaraderie and brotherhood built on Darterong Pinoy’s foundation that darts is “free for all”. 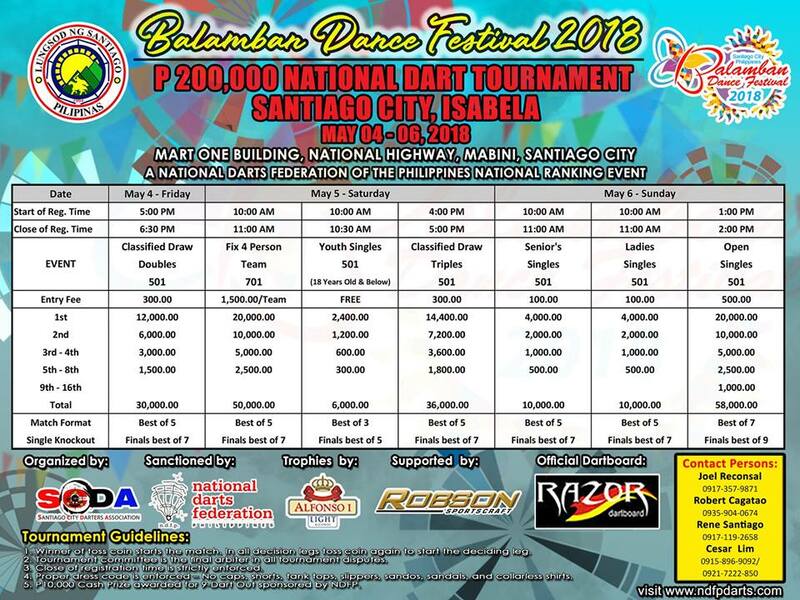 The NDFP Ranking and Sanctioned tournaments are expanding nationwide. Participation is rising, less known competitive players are increasing, and new dart areas are emerging. 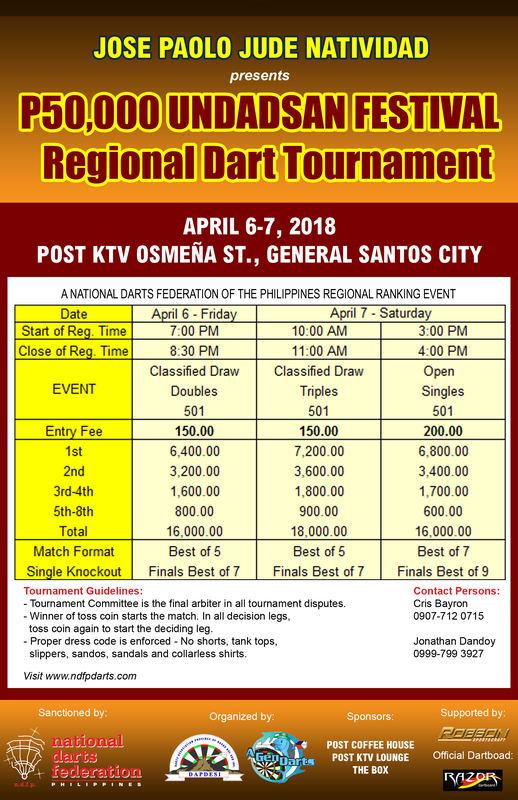 The National Darts Federation of the Philippines (NDFP) sustains this nationwide development of darts with the NDFP Regional Player Ranking, a platform of recognition to motivate and inspire our regional players to excel and to gain national attention. To quote NDFP President Tito Soncuya “We hope that the identification of the Top Regional Players will encourage and engage other players from the different regions to strive for recognition and excellence”. The National Darts Federation of the Philippines is honored to confer the NDFP President’s Award to Hian Heng “Allen” Kea of Singapore during the Araw ng Parangal of the P200,000 Free Registration Darterong Pinoy last October 28, 2017 at the Winford Manila Resort & Casino. The NDFP Araw ng Parangal (Day of Recognition) is a day to recognize and acknowledge individuals for their exceptional performance or contribution to Philippines darts. Noel Malicdem of Robson maintains the top spot in the National Player Ranking of the cumulative Rolling 2 years Ranking Points performance from October 2015 to September 2017. Malicdem’s win in the 650K Casino Filipino Tournament extended his lead over 2nd placer DJ Tongcopanon by over 200 points. Noel Malicdem, “The Gentle Giant” from Team Robson, won his 6th Open Singles title for the year earning a total of 530 NDFP ranking points for the 2017 Darter of the Year Award. Malicdem won the Open Singles of the 650K Casino Filipino Angeles City, the biggest tournament of the year, and the 100K Baguio Day Open, all in the 3rd Quarter. Malicdem leads 2nd placer, DJ Tongcopanon by 166 ranking points going in the last quarter of the year. Billed as "Asia's Biggest Darts Event", the Malaysian Open 2017 (MO17) lived up to expectations, as described by Nancy Ambrose, President of the Malaysian Dart Association (MDA) "an amazing tournament...with over 800 participants in the Team, Men's and Ladies Singles events.. from 17 countries across the globe." 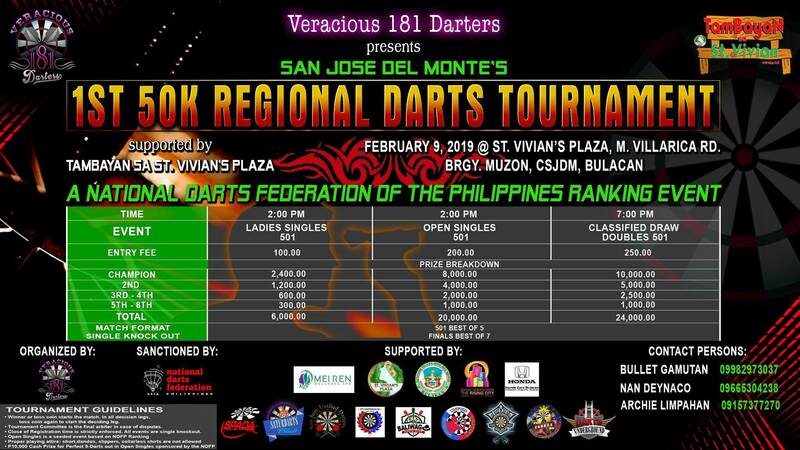 The tabulation of the Top Regional Players is in recognition to our nationwide dart players who are the top players in each of the NDFP regional dart areas. This is to acknowledge their contribution and participation in the NDFP Sanctioned and Ranking events. Hopefully this will inspire our players in the different regions to strive for recognition and excellence. Finally, Noel “The Gentle Giant” Malicdem of Robson Sportscraft is on top of the NDFP Player Ranking for the 1st time. After winning the Masters Cup, Darter of the Year and the Federation Cup - the Grand Slam of Philippine Darts and the MVP Award of the 400K Mayor Romuladez Open, it is fitting and deserving for Noel to emerge as the top player in the National Player Ranking. Noel Malicdem, the “Gentle Giant” from Robson Sportscraft, leads the 2017 Darter of the Year Award after the 2nd Quarter of 2017. The Darter of the Year ranking points came from the 26 Open Singles Ranking tournaments from Santiago City, Isabela to General Santos City, broken down into 17 national and 9 regional open singles. The total NDFP Ranking tournaments totaled 2.8M cash prize from January to June 2017. Noel Malicdem of Team Robson threw the last dart of the 400K Mayor Romualdez National Darts Tournament to win the MVP Award. The Mayor’s Open Singles, the last event of the tournament with 20K for the champion and 10K for the losing finalist, was a fitting finale to a dramatic and exciting race for the 50K MVP Award. The player with the most money won in the tournament wins the MVP. 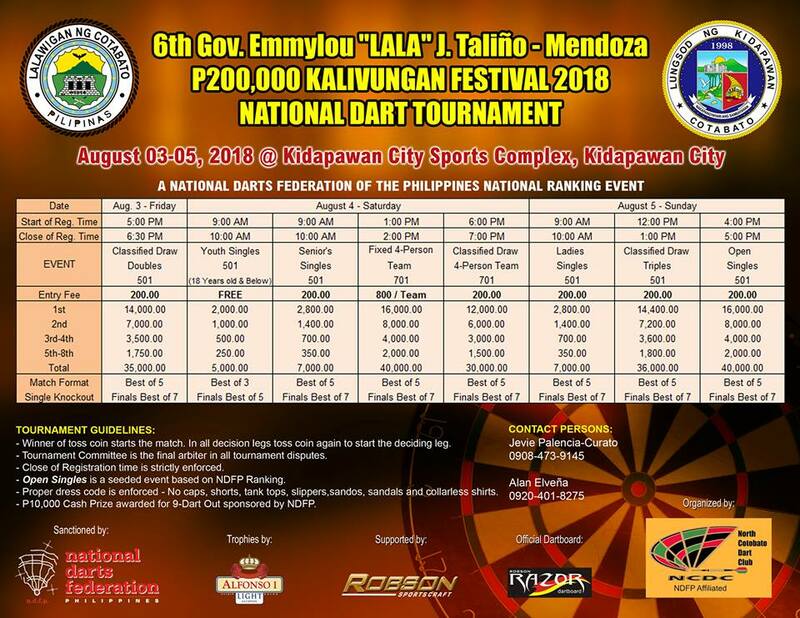 Greater excitement and anticipation is in store for players attending the 3rd Mayor Romualdez National Dart Tournament this weekend, June 16-18 at Patio Victoria in Tacloban City. The total cash prize is now 400K with the addition of 50K for the Mythical Five Award. The Mythical Five Award is an innovation to the uniquely original Mayor Romuladez Tournament’s Most Valuable Player (MVP) Award. To add spice in the battle for the P50K MVP title, players who will place 2nd to 6th places in the MVP race will be called the Mythical Five and awarded P10K each. Noel Malicdem, the “Gentle Giant”, completes a Grand Slam win after bagging the recent 2017 Federation Cup, the 2016 Darter of the Year Award, and topping the Masters Cup in October 2016. The NDFP ranking tournaments are intensely exploding nationwide. The influx of new players earning ranking points is increasing. Though their ranking points may not be enough to put them in the national limelight, their performance may be on top of their regions. 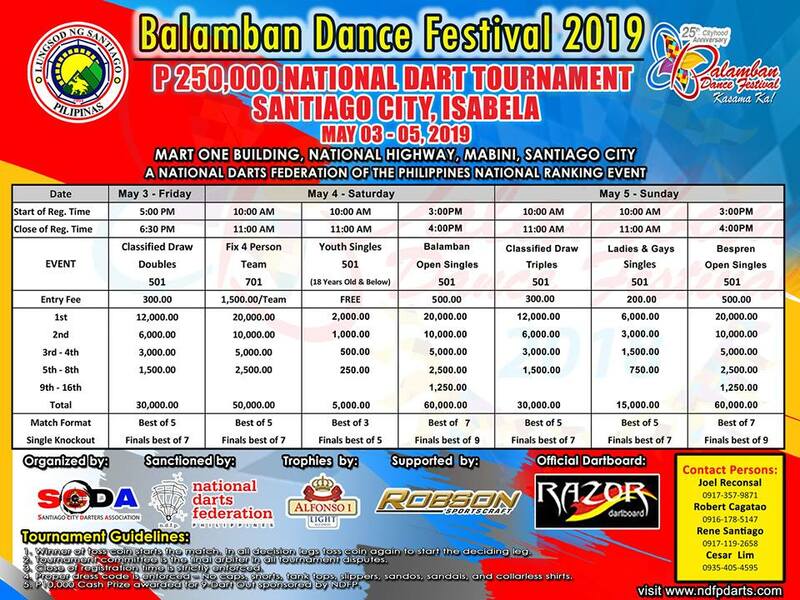 Thus, the NDFP Top Regional Player Ranking is a tabulation of player’s performance to acknowledge the tremendous growth of NDFP ranking and sanctioned tournaments in the regional dart areas from the Cordillera all the way down to Zamboanga City. We hope that providing recognition on our lesser known regional players will spur the aspirations to excel and to further strive for national recognition. In this way the growth of regional areas will also be enhanced. Dolreich “DJ” Tongcopanon of Robson-Gensan maintains the top spot in the NDFP National Player Ranking coming from 62 NDFP Ranking Tournaments from April 2015 up to March 2017. This is the 4th straight quarter that the youngest National Master has been leading the National Ranking. Noel Malicdem is gaining ground on the lead of DJ with his 2 Open Singles win in the first quarter. Christian Perez kept 3rd place with a win in the 100K Hinugyaw Open Singles. Noel Malicdem of Robson-Pasig leads the 1st Quarter ranking for the 2017 Darter of the Year Award. 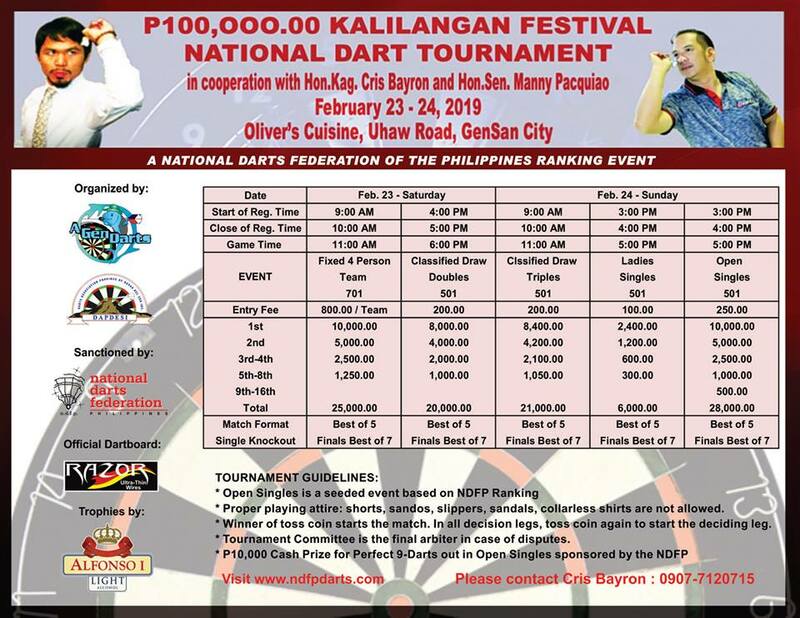 Malicdem, dubbed as the “Gentle Giant”, continues his winning streak as the Chris Sports 2016 Darter of the Year Awardee with back to back Open Singles championships in the 100K Kalilangan Festival in Gensan and the 150K Araw ng Dabao, supported by his T4 finishes in the 120K Emong Cup and the 150K Panagbenga Open. The elite circle of the best Philippine dart players are invited to compete in the prestigious NDFP Federation Cup 2017 on May 26 and 27 as the highlight of the 250K Robson Summer Dartfest at the Il Centro, Sta Lucia Mall. To showcase their darting excellence are the top 32 NDFP Ranked players, ending December 2016. NDFP National Master and top ranked player Dolreich “DJ” Tongcopanon of Robson-Gensan will defend his back-to-back Emong’s Cup Open Singles title at the 3rd Philippine Columbian Association P120K Darts Open on March 18 – 19, 2017 at the PCA Sports Center in Plaza Dilao, Paco, Manila. The opening salvo of the 2017 National Capital Region NDFP Ranking Tournaments starts with the 3rd Philippine Columbian Association - Emong’s Cup this Saturday and Sunday, March 18-19, at the PCA Club House in Plaza Dilao, Paco, Manila. 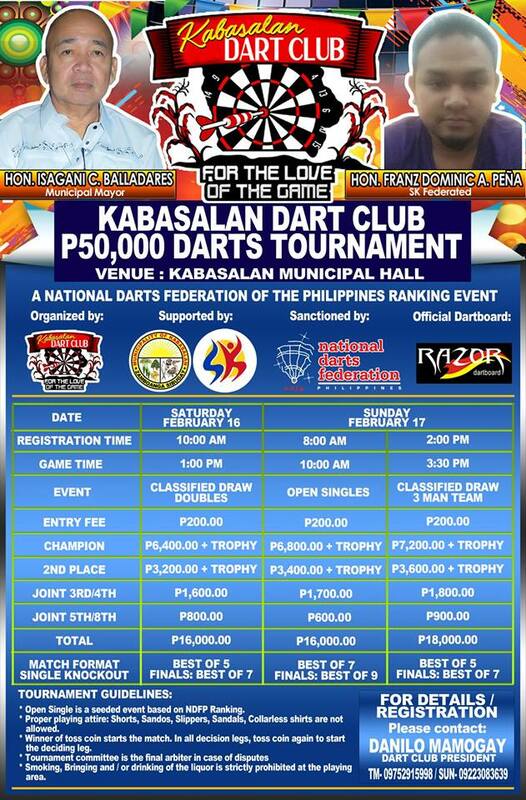 Tengku Shah, the top Malaysian dart player and the only foreign Philippine Master, arrived in Davao City this morning to compete in the NDFP National ranking tournament – the 150K Araw ng Dabao, slated for March 10-12 at the Felis Resort Complex, Davao City. Alexis Toylo finally lived up to expectations by winning the Open Singles of the 150K Panagbenga Open last February 19, 2017 in Baguio City. After pocketing the 10K special award for his perfect 9-darts out in the Open Singles of NDFP Ranking 120K Huling Hirit Tournament in Davao City, December 2013, he was highly anticipated as a potential champion in the making. 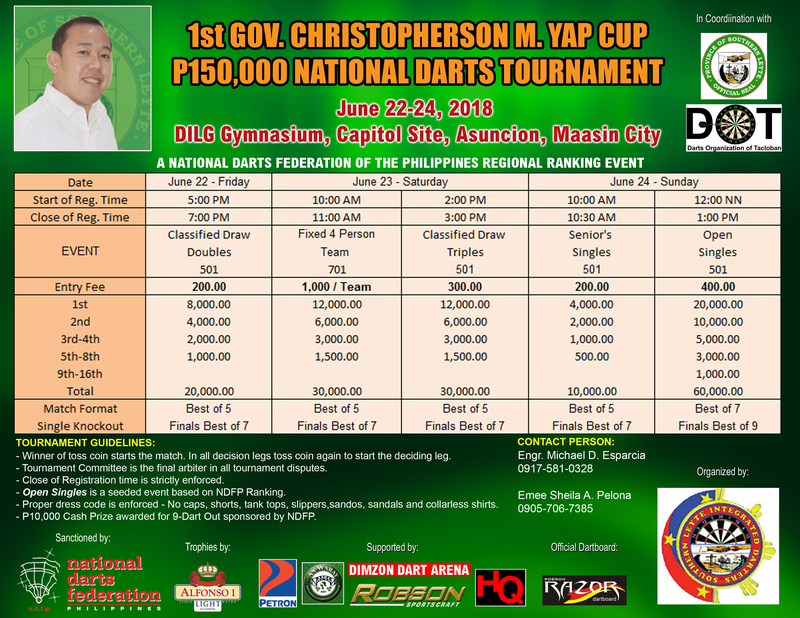 Cagayan de Oro City (CDO) is in the midst of an exceptional darts revival. Thanks to the untiring support and dedicated organizing efforts of NDFP Regional Coordinators Jojo Gaane and Danny Quilinging. 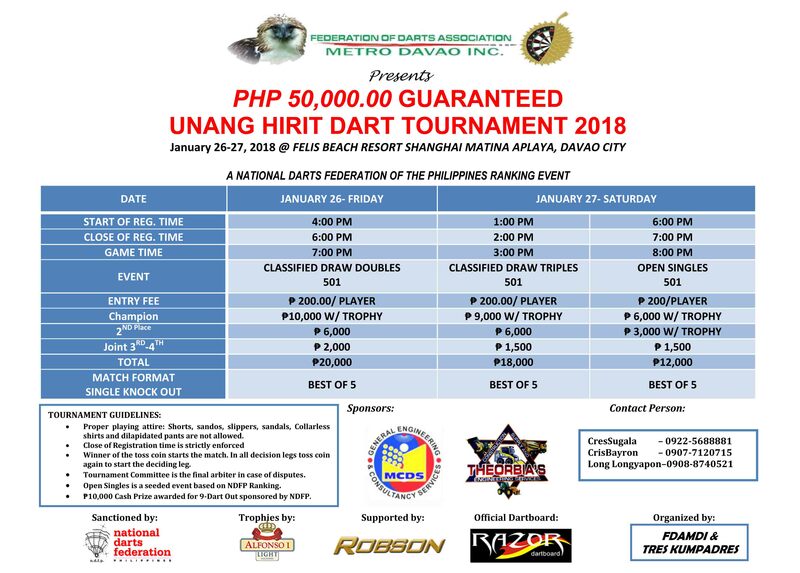 They coordinated in the opening of new dart venues and bringing back the NDFP Ranking and Sanctioned tournaments in CDO after an absence of three years. The 2017 NDFP Ranking & Sanctioned tournaments unfolded with the 100K Hinugyaw Open last Jan. 6-8, 2017, with a record breaking attendance in Koronadal City. It was an auspicious start to almost A MILLION TOTAL CASH PRIZE of the NDFP Ranking Tournaments for the 1st Quarter of 2017. The NDFP Ranking Tournaments opened 2017 with better than expected attendance at the 100K Hinugyaw Open held in Koronadal City last January 6-8, 2017. The participation of darters coming from all over Mindanao is an indication of better things to come in 2017. Fast-Track, the innovative software developed by the NDFP was launched in Mindanao to standardize and professionalize the running of NDFP Ranking Tournaments nationwide. The software was given free to all tournament directors of the NDFP Affiliated Local Dart Organizations, following a seminar conducted by NDFP President Tito Soncuya and NDFP Tournament Director and Fast-Track Product Development Team Leader Ryan Suarez..
Dolreich “DJ” Tongcopanon, Jr. of Robson-General Santos City maintained his number 1 spot at the end of the 4th Q of the NDFP Player Ranking. This is the third straight quarter that Tongcopanon topped the NDFP Player Ranking, after overtaking Christian Perez of Koronadal at the end of the 2nd quarter in 2016. Noel Malicdem of Team Robson is the 2016 Chris Sports Darter of the Year, pocketing the P25K Darter of the Year Award from Chris Sports. 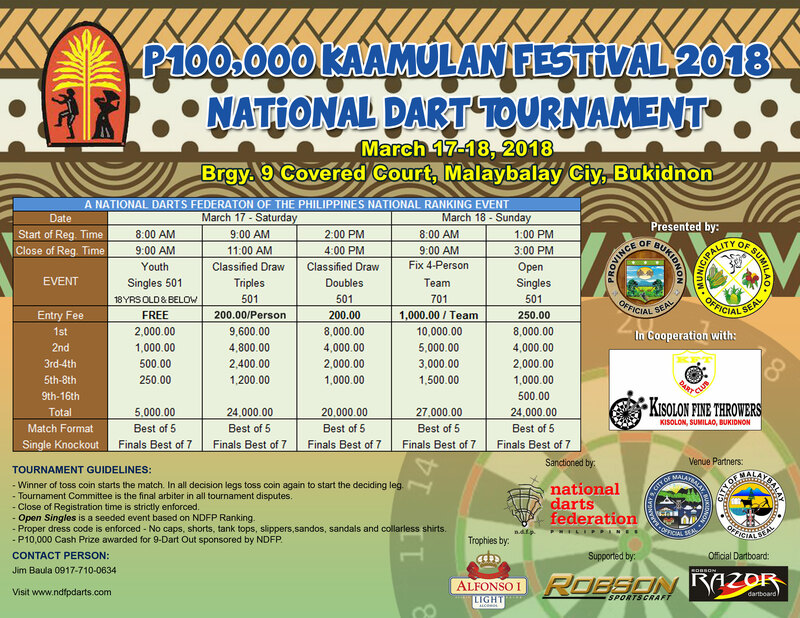 Malicdem placed in 13 out of 27 NDFP 2016 ranking tournaments, including two (2) national championship titles, the P200K Darterong Pinoy and the P120K Blue Palawan National Tournament. 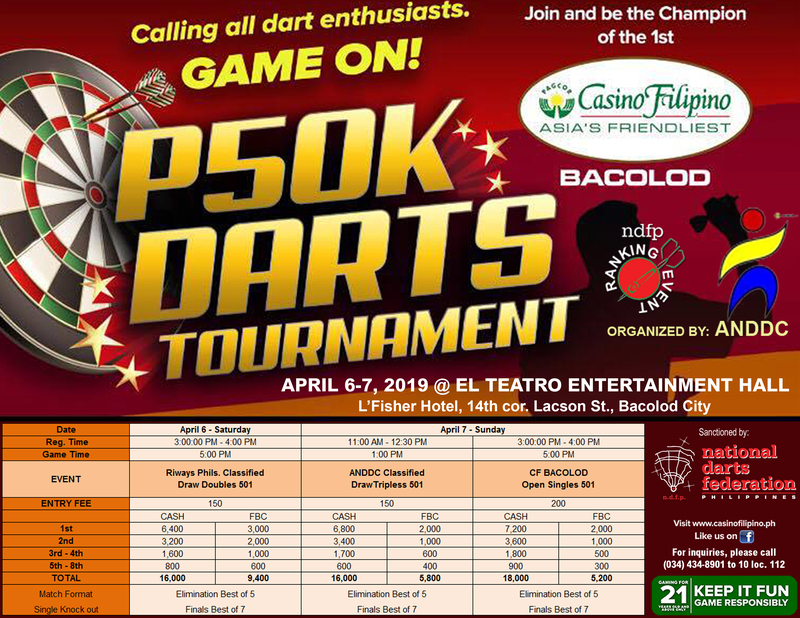 A run-away winner, Malicdem accumulated 350 points – over a hundred points away from 2nd placer Christian Perez with 248 points (2014 Darter of the Year) and 3rd placer DJ Tongcopanon with 244 points (2015 Darter of the Year). Leonor Lumabi is the latest recipient of the NDFP President’s Award during the Araw ng Parangal of the P200,000 Free Registration Darterong Pinoy held last October 22, 2016 at the Sta. Lucia Mall. The finals of the Masters Cup 2016 was played on the 3rd day, to give enough time for the finalists to rest after a grueling quarterfinals and semifinals of best of 5 set best of 5 legs the previous night. The National Darts Federation of the Philippines concluded another successful blockbuster edition of the free registration Darterong Pinoy – the biggest and most anticipated dart tournament in Metro Manila held from October 21 to 23, 2016 at the Sta. Lucia Mall. Waka Mendoza of Baguio City won the Darterong Pinoy 2016 Female/Ladies Singles. Being a gay person, endless discussions are on-going. 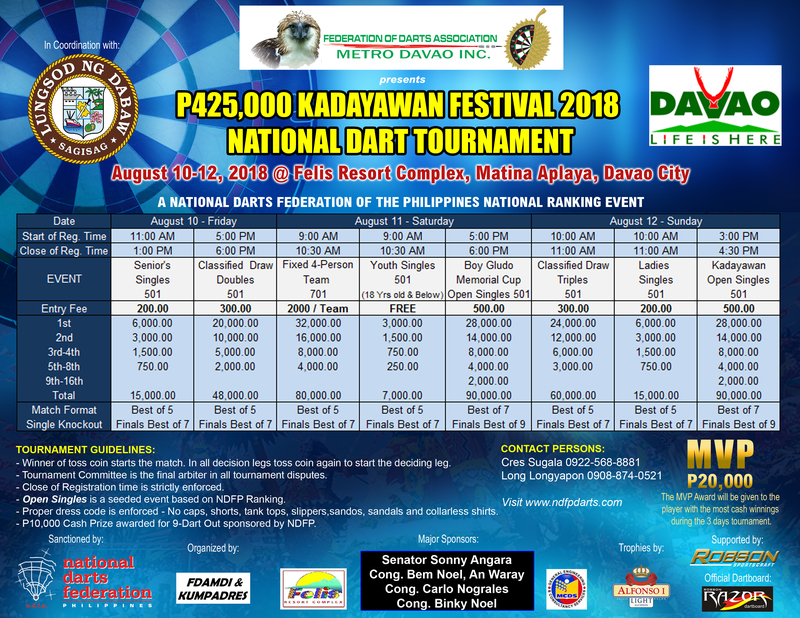 The position of the National Darts Federation of the Philippines (NDFP) as the event organizer on the ladies’ singles is misunderstood. And, not universally clear to the darting community especially to the male darters who vigorously oppose the integration. 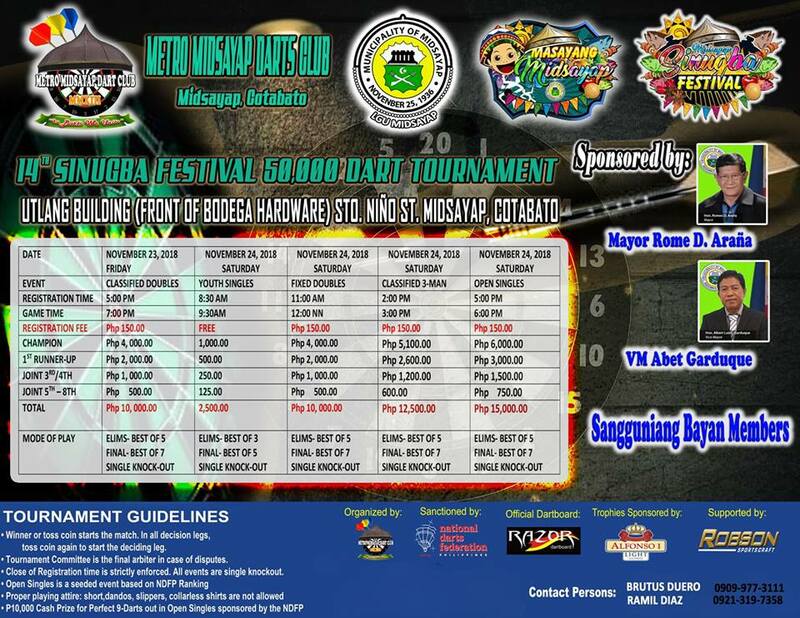 The Biggest Free Registration Dart Tournament starts this Friday!! 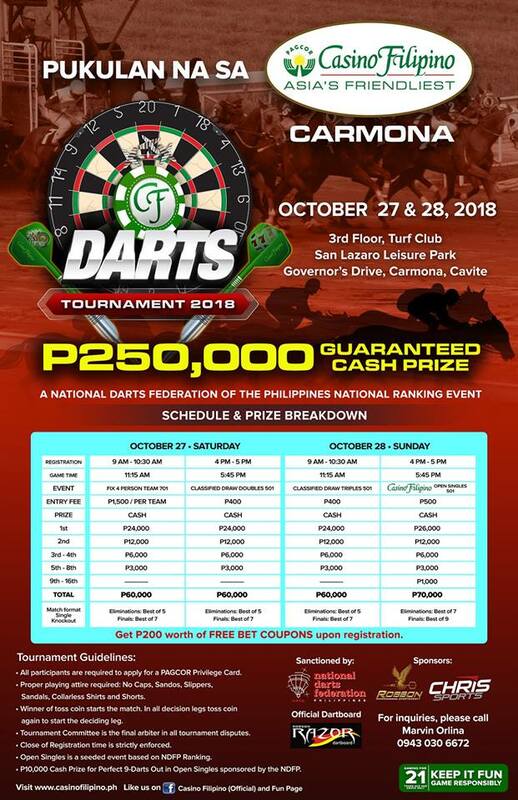 The National Darts Federation of the Philippines (NDFP) launches another blockbuster and memorable tournament starting October 21-23, 2016 at the Sta Lucia Mall – the P200,000 Free Registration Darterong Pinoy, the year’s most awaited and biggest free registration dart tournament in the country. The NDFP Ranking points earned after the 3rd quarter shows a very close race for the 25K Chris Sports Darter of the Year Award for 2016. Eighty (80) ranking points separate the top 5 players with 3 months till the end of the year. Budz Dunham, a leading pillar of darts in Southern Luzon passed away September 1. His body lies in state at their family residence in Lucena City, and internment will be on Tuesday, Sept. 6, 2016. 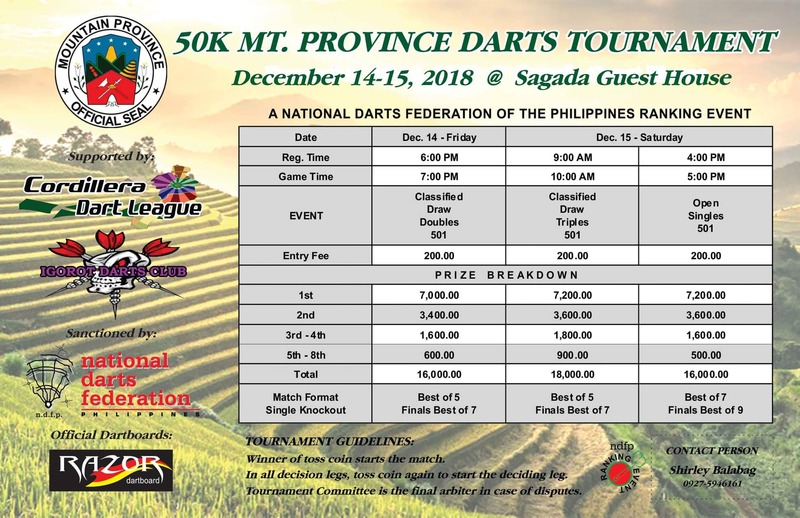 The NDFP is extending the ranking of NDFP Sanctioned and Ranking Tournaments to the top 10 Regional players based on the Regional Dart Areas of the NDFP. 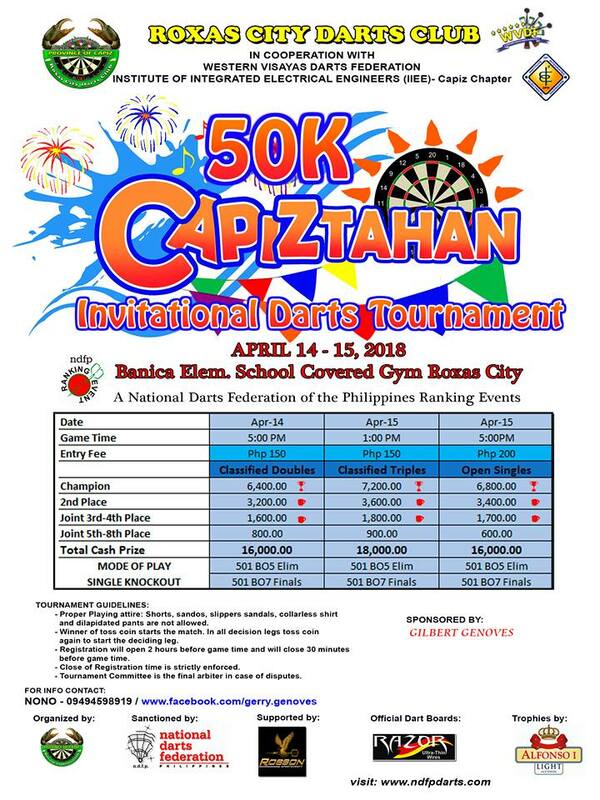 Aside from the top ranked national players with the most ranking points, due recognition is broadened to the regional dart players as an appreciation to the support of the nationwide dart players and organizers. 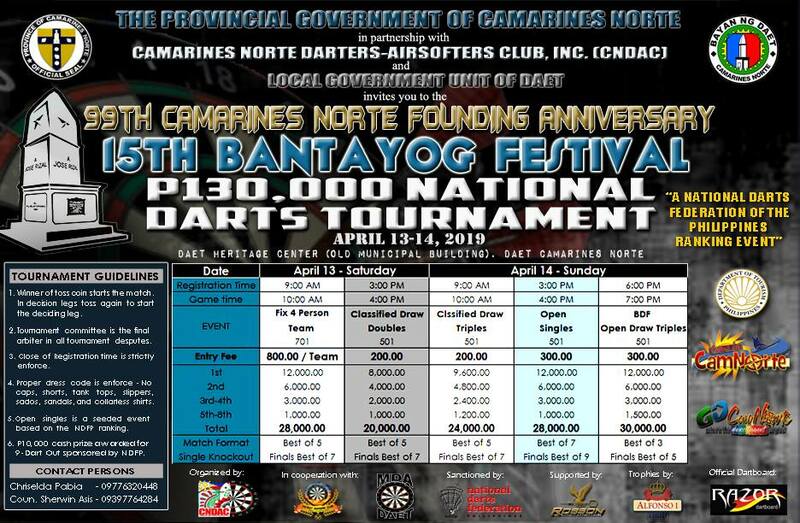 This is also to acknowledge the tremendous growth of NDFP ranking and sanctioned tournaments in the regional dart areas from the Cordillera all the way down to Zamboanga City. A total of P50,000 was raised since May 2016 for the Jericho Eguia Medical Fund Drive - a medical assistance project of the National Darts Federation of the Philippines (NDFP) to help support the family of Jericho in his on-going battle against Leukemia. Dolreich “DJ” Tongcopanon Jr. is the NDFP top ranked player ending June 2016. The NDFP player ranking is the accumulated total points earned representing two years performance from July 2014 to June 2016. Consistency of performance symbolizes the Player Ranking. Dolreich “DJ” Tongcopanon, Jr., of Robson-GenSan takes a slim lead for the prestigious P25K Chris Sports Darter of the Year Award after the 2nd Quarter of 2016. DJ is back on track in defense of his 2015 Darter of the Year Award. As of June 25, 2016, the continuing Jericho Eguia Medical Fund Drive of the National Darts Federation of the Philippines reached a total amount of PHP 45,300. The Jericho Eguia Medical Fund Drive is a medical assistance project to Jericho Eguia, a 16 years old cancer patient, suffering from Leukemia. Jericho is the son of a fellow darter and 2010 Darterong Pinoy Singles finalist, Francis Eguia. Trazzy Jezryl Plaza, the charming lad from Butuan City is the darling of the crowd at the recently concluded 2nd Mayor Alfred Romuladez 325K National Darts Tournament. Not only is Jezryl handsome and amiable, but for a 12 year old to display the poise and excellent technical skill in playing darts is outstanding and indeed a crowd drawer. Melvin Kent Pelona is the Triple Crown winner of the 2nd Mayor Alfred Romuladez – 325K National Darts Tournament held at the Patio Victoria, Tacloban City last June 10-12, 2016. Melvin etched his name in history by hitting a perfect 9-darts out, winning the Sangyaw Open Singles title, and with his T8 performance in the Mayor’s Cup, won the MVP Most Valuable Player award of the tournament. 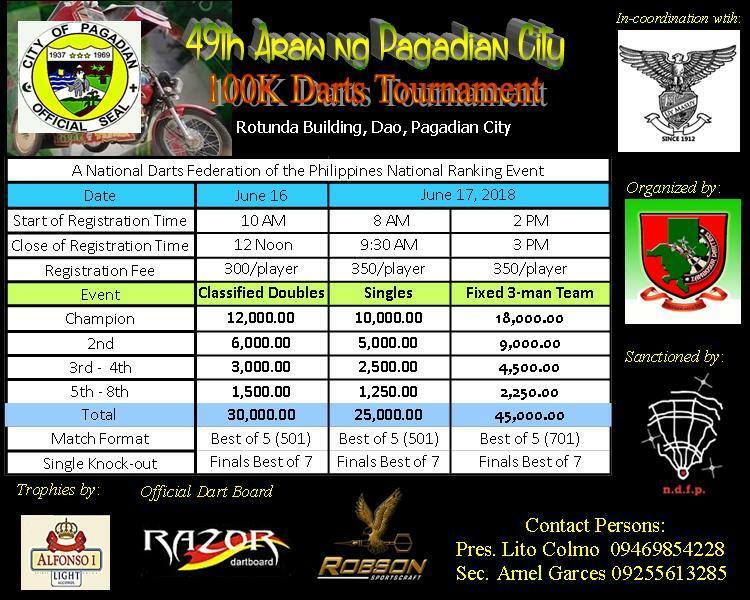 All roads lead to Tacloban City from the mountains of the Cordillera to the hinterlands of Mindanao for the 2nd Mayor Alfred Romualdez- 325K National Darts Open, this Friday, June 10-12. All systems are a go for the richest NDFP sanctioned ranking tournament for 2016 opening with a sumptuous dinner hosted by the Hon. Mayor Romualdez before the first event. The Chris Sports and Robson Sportscraft 200K Summer Dartfest 2016 was a resounding success --- Success that attendance is beyond expectation, that people are optimistic and positive in their experience, and that the best darting performance was displayed. 2015 Chris Sports Darter of the Year Awardee, Dolreich “DJ” Tongcopanon of Robson-Gensan emerged victorious in the 2016 NDFP Federation Cup winning over newly installed National Master Prussian Arceño of Dominics 2-0 in the best of three sets-best of seven legs finals. DJ was trailing Prussian Arceño 3-0 in the first set when DJ came back strong to even the score 3-3 setting up a thrilling deciding leg won by Tongcopanon. The 2nd set was Tongcopanon all the way winning the set 4-1, and the championship. Jericho Eguia is a 16 year old cancer patient since 2014, suffering from Leukemia. The Jericho Eguia Medical Fund Drive is a medical assistance project of the NDFP to Jericho and his family. Jericho completed his 8th chemotherapy session to no avail and continues to suffer severe muscle pain (cancer pains), skin bruises called hematoma on the knees and legs, and small red spots on other parts of his body. His body has become weak and frail to endure future chemotherapy sessions that can harm his other vital organs. Bone Marrow/ Stem Cell treatment is an alternative for survival. 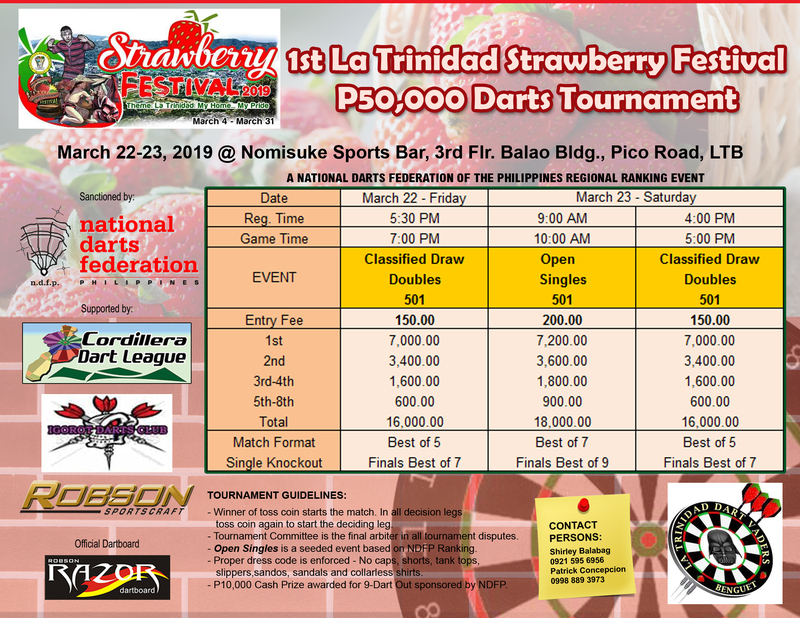 The Invitational Free-Registration FEDERATION CUP is set on May 27-28, 2016 at the Il Centro, Sta Lucia Mall along with the P200K Robson and Chris Sports 2016 Summer Dartfest. The Top 32 NDFP Ranked Players ending December 31, 2015 are invited in recognition for their outstanding performances in the last 2 years. The champion wins P12K, the 2nd place pockets 6K and the top 4 with P3K each. Congratulations Jaypee Detablan for winning his 3rd NDFP National Open Singles Championship in the recently concluded 100K Erap Cup, thus becoming the 14th NDFP National Master. Jaypee previously won the 100K Tulungan Po Natin Sila Open Singles in Zambales, December 13-15, 2013 and the 250K Resorts World Manila Open Singles Championship in October 30-31, 2014. The P25K Chris Sports Darter of the Year award is wide open after the 1st Quarter of 2016. Lito Peresores of General Santos City is the co-leader with 60 points after bagging the championship of the 100K Kalilangan Festival and landing Top 8 in the 100K Philippine Columbian Association Open (PCA). . The 2016 MVP Organizing Committee commissioned the National Darts Federation of the Philippine to oversee and manage the inclusion of darts in the sports festival of the Manny V. Pangilinan Group of Companies better known as the 2016 MVP Olympics. Congratulations, Prussian Arceño, the new NDFP National Master. 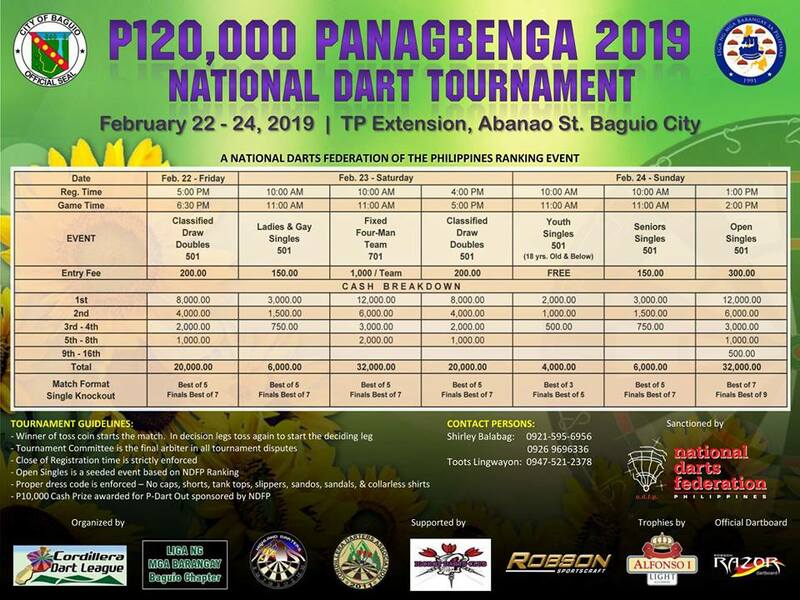 Prussian won the Open Singles of the 120K Panagbenga National Darts Tournament last February 21 in Baguio City to attain his 3rd National Open Singles crown and the 13th NDFP National Master Title. 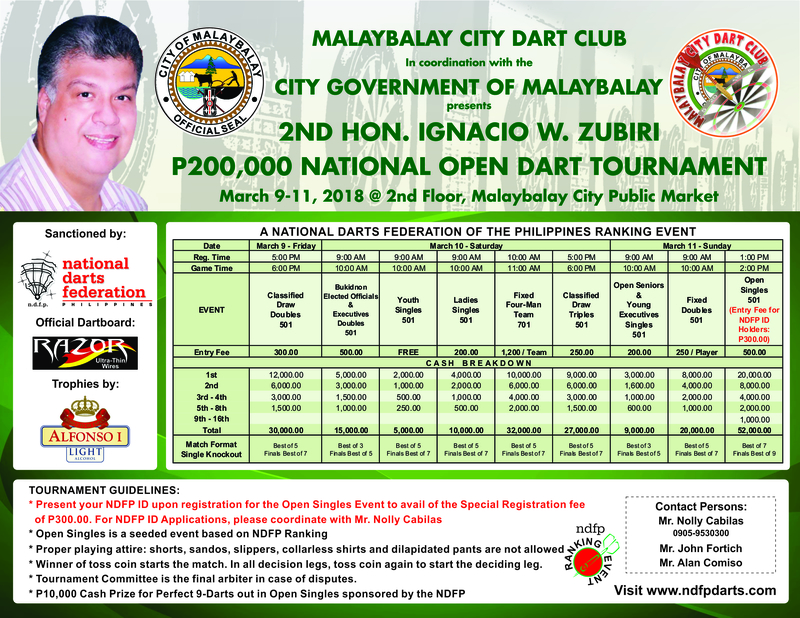 The 1st Philippine Columbian Association 100K National Darts Open came to a very successful conclusion last February 7, 2016 after two days of intense competition highlighted by the ascendant performance of Dolreich “DJ” Toncopanon Jr. 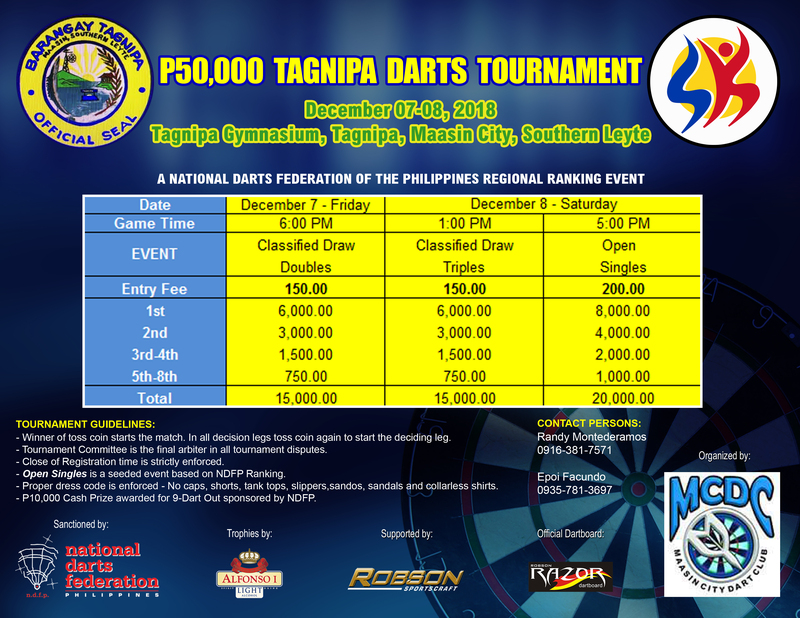 The 2016 National Darts Federation of the Philippines (NDFP) National Ranking and Sanctioned Tournaments kicks off on a high note with four (4) weeks of tournaments starting on January 29-31, 2016. This marks the beginning of a year-long campaign for the prestigious P25K Chris Sports Darter of the Year Award. 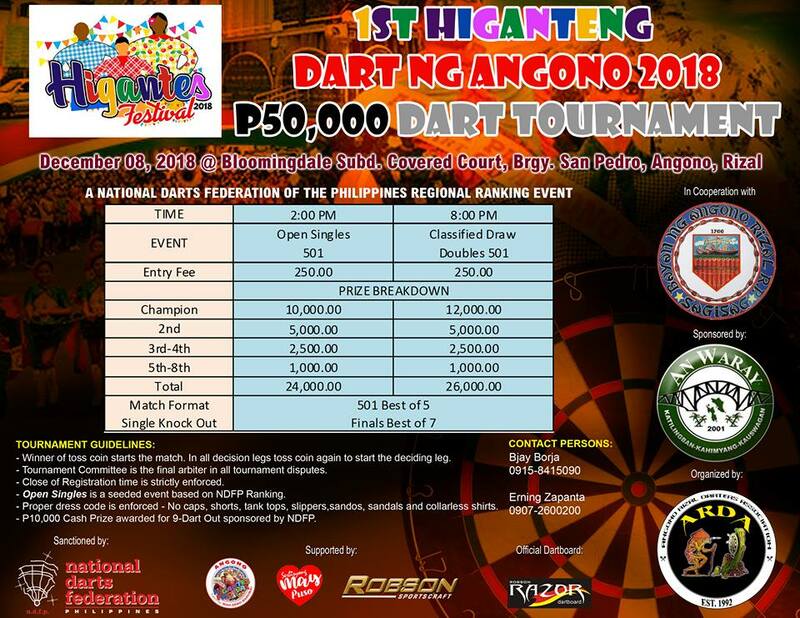 Will Dolreich “DJ” Toncopanon Jr., 2015 Darter of the Year Awardee have another runaway victory, or will the top-ranked NDFP Players Christian Perez and Lourence Ilagan reassert their dart supremacy for the 2016 Darter of the year? Will another unknown player emerge in 2016 or will the up-and-coming players, silently waiting in the sidelines, rise to the challenge of competition? Christian “The Titan” Perez maintains the top ranking of the NDFP National Player Ranking at the end of the 4th Quarter of 2015 with 572 points. Closing in on the top ranking is Lourence Ilagan with 556 points and only 16 points behind. Rounding the top 8 are Prussian Arceño in 3rd, Bong Gabiana in 4th, DJ Tongcopanon in 5th, Bhoy Ulang in 6th, Alexis Toylo in 7th, and Boy Gionzon in 8th. There is no doubt that statistics objectively showed that our top players remain to be Christian Perez and Lourence Ilagan. 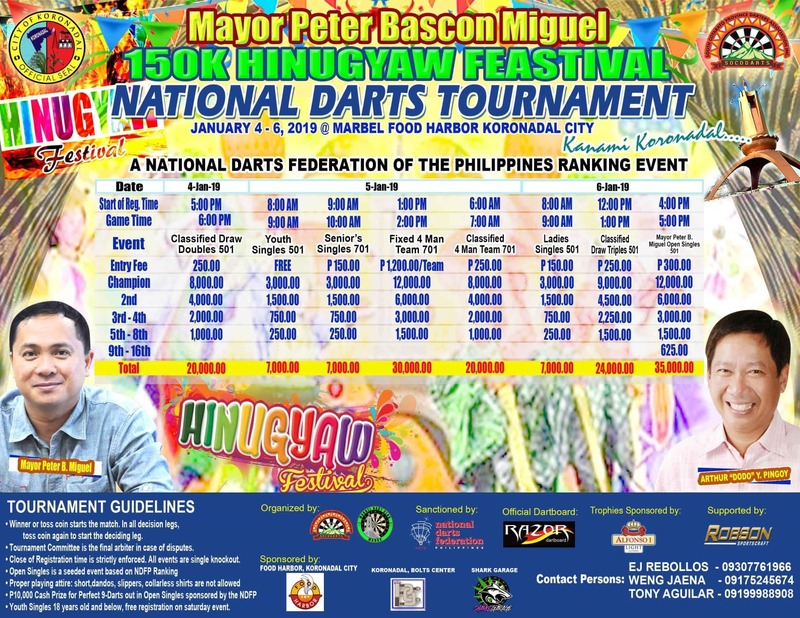 2015 is an outstanding year for darts as the National Darts Federation of the Philippines vigorously pursued the twin pillars of growth to sustain the expansion of darts – the ranking tournaments and the dart leagues. 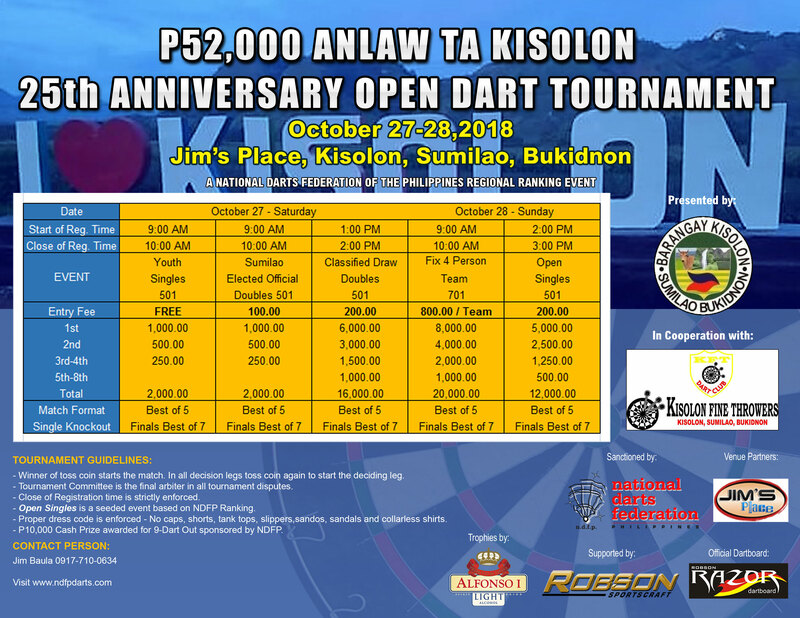 For the first time in the history of Philippine darts, thirty (30) NDFP Ranking and Sanctioned Tournaments were launched in Luzon, Visayas and Mindanao integrated under the leadership of the National Darts Federation of the Philippines (NDFP). 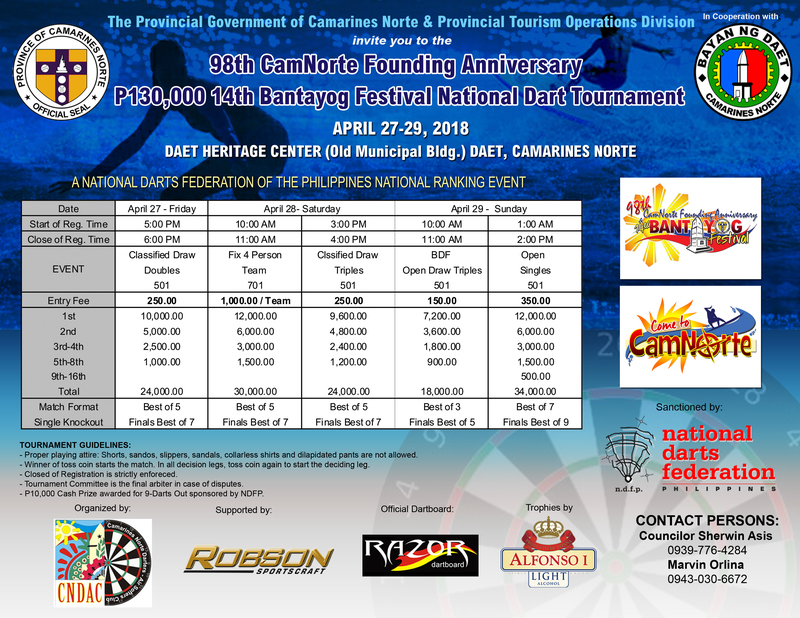 A total of 3.65M in tournament cash prize was raised by the national network of dedicated NDFP affiliated dart organizations from the mountains of the Cordillera to the hinterlands of Mindanao. 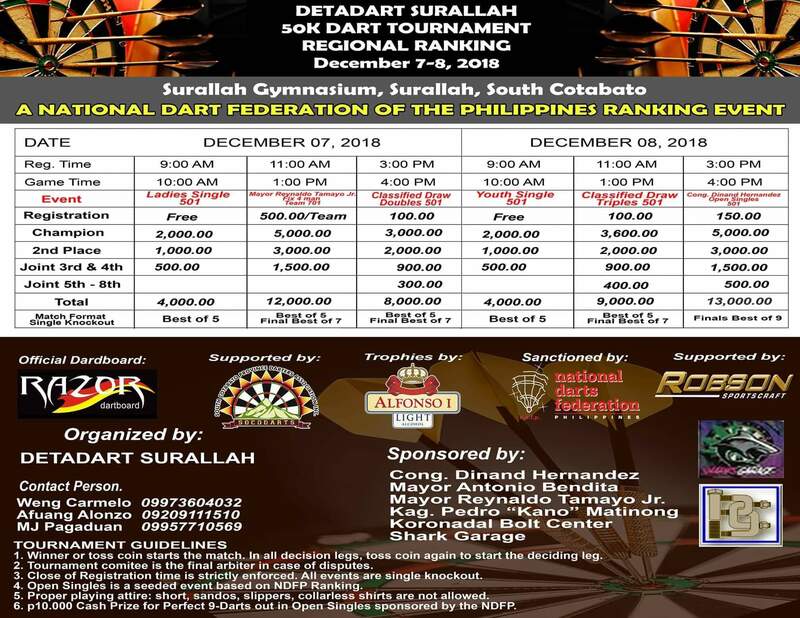 Dolreich “DJ” Tongcopanon Jr. is the runaway winner of the P25,000 Chris Sports Darter of the Year Award after winning the P100K Inugyunay Festival, the last ranking tournament for 2015, in Tacurong, Sultan Kudarat, last December 20, 2015. DJ handily won over National Master Jojo Barellano 4-1 in the finals, after Barellano edged National Master Ian Perez 4-3 in the top 4. En route to the finals, DJ avenged his loss in the Darterong Pinoy to Regional Master Iking Gumanid with a winning score of 4-0. Congratulations to the triumphant winners of the successfully concluded Federation Dart Leagues (FDL) in Metro East and in Manila organized by the National Dart Federation of the Philippines (NDFP). 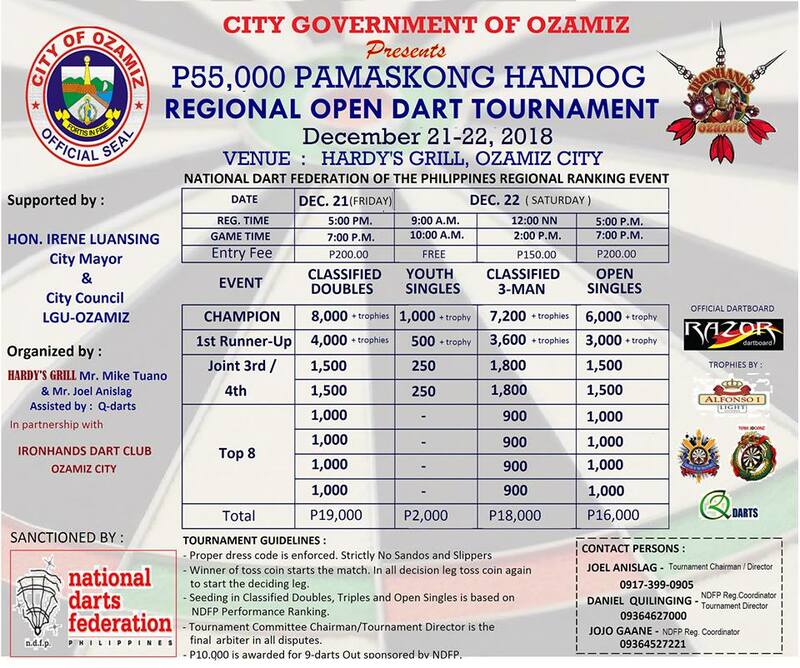 Thank you to the 74 dart teams of over 450 participating darters, and to the host dart venues: Red Lane of Shane Ocampo, TresMa led by Eugene Pioquinto and Reggie Francisco, and Darkside of Genalyn Ginoo. The league was made possible by our corporate sponsors Robson Sportscraft, Chris Sport, and especially by Alfonso I Light for the sponsorship of over 100 league trophies. The success of the Federation Dart Leagues is through your support and through the efficient supervision of the NDFP staff Marvin Orlina, Rommel Escubil, Rey Santos, and Ryan Suarez. To all, Maraming Salamat! The crowd watched in admiration and amazement as the Pinoy darters displayed flawless darts to dominate the Phoenix Darts Macau Open held last Nov 7-8, 2015 at the Sofitel Hotel in Macau under the auspices of the Asian Dart Association of Hongkong. 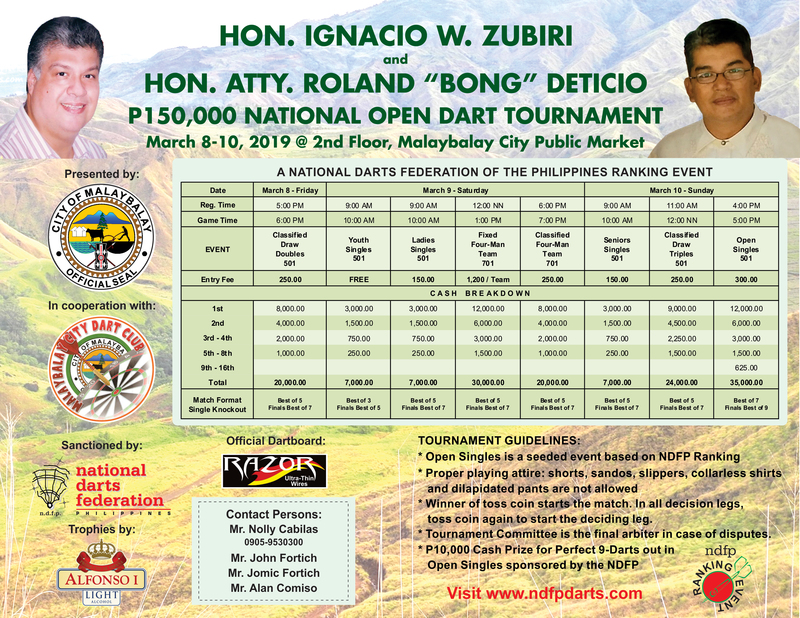 Dart players with the NDFP ID and Privilege card breezed through the tournament registration of the jam-packed Free Registration Darterong Pinoy, held last October 16-18 at the IL Centro, Sta Lucia Mall. Through the means of a Bar Code Scanner, NDFP card holders were treated to a convenient, faster and technologically advanced mode of player registration. Players need not physically write down their names to register and just present their IDs to be scanned instead. This may be the wave of the future on how tournament registration will be handled. Jeffrey Arciosa of Robson –Sultan Kudarat came out victorious again over top ranked Christian Perez of Robson –Koronadal, in the finals of the Open Singles of the P55K FDAMDI 7th Anniversary and Boy Gludo Memorial Cup held last October 25th in Davao City. Arciosa repeated his win over Perez from the recently concluded Open Singles championship of the P100K Araw ng Digos National Tournament held in Digos last September 6, 2015. NDFP top ranked player Christian “The Titan” Perez displayed a fighting heart of a champion and won the NDFP 2015 Invitational Masters Cup last October 18 at the Darterong Pinoy Tournament in IL Centro – Sta. Lucia Mall. His zealous determination to win guided his mental toughness, poise, and confidence. National Darts Federation of the Philippines (NDFP) Araw ng Parangal - a day to recognize and acknowledge player or players who have excelled, and individuals or organizations who contributed to the advancement of darts adhering to the ideals, values and vision of the NDFP, was held last October 17, 2015 during the Darterong Pinoy. Dolreich “DJ” Tongcopanon of Robson-Gensan won the Open Singles of the Resorts World 300K Dart Attack last October 11, 2015 at the Newport Mall of Resorts World Manila. Fresh from his win in the Emong’s Cup last month, DJ outclassed last week’s champion of the Tamparuli Open in Sabah, Prussian Arceño 5-2 in the finals. Dolreich “DJ” Tongcopanon of Robson-Gensan leads the P25,000 Chris Sports Darter of the Year Award with 296 Ranking Points after the 3rd Quarter of 2015. The 20 year-old Tongcopanon gained 92 points in the five (5) NDFP Ranking and Sanctioned Tournaments in the 3rd Q, with a Championship in the Emong’s Cup, 2nd in the 150K Gov. 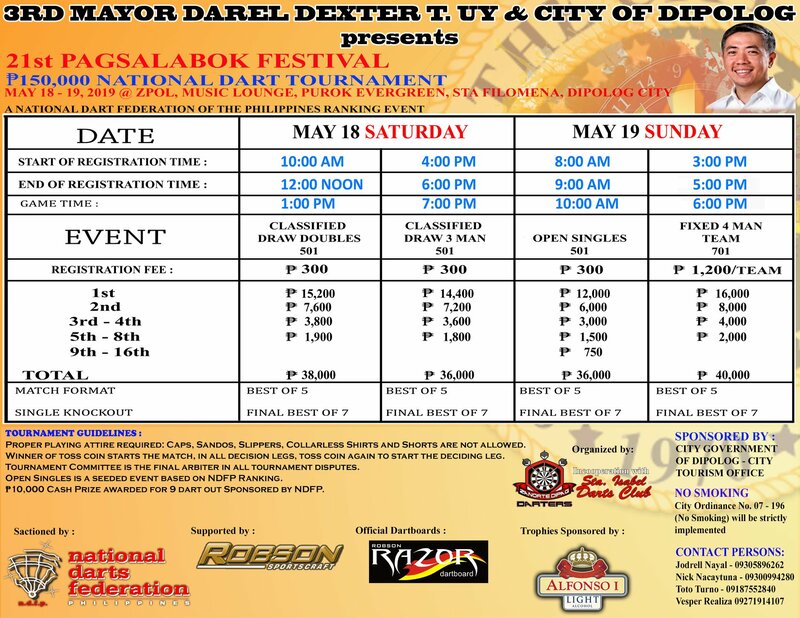 Mendoza Kalivungan Festival, and top 8 finishes in the 100K Araw ng Digos and the 150K Kadayawan Festival. DJ missed the chance to be the 12th National Master when teammate Bong Gabiana crushed him in the finals of the Gov. Mendoza Cup, 5-1, with 6 T80’s. This could have been the 3rd National Tournament (100K and over) title of Tongcopanan and thus earn the title National Master. Christian “The Titan” Perez of Robson-Marbel retains the top NDFP Player Ranking after the end of the 3rd Quarter 2015. The NDFP Player Ranking is the accumulated Rolling 2 Years ranking points earned from October 2013 to September 2015. These ranking reflects the player consistency of performance in the last 2 years, and this is the basis for the seeding of players in the Open Singles. 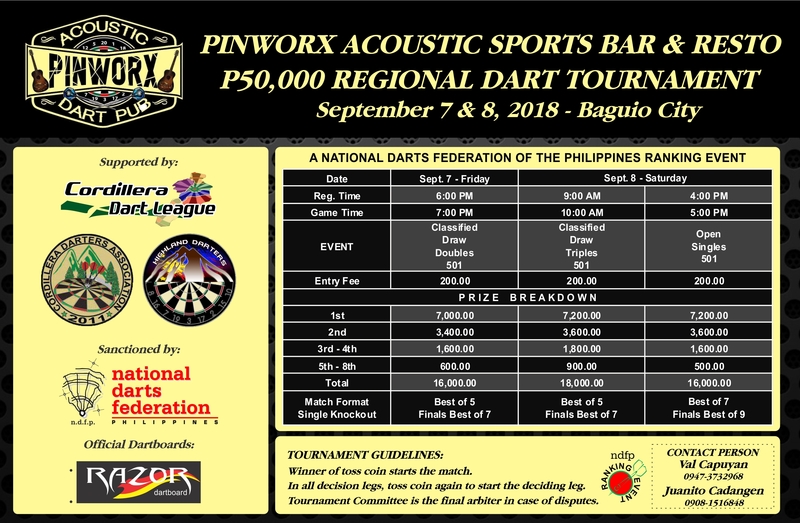 Dart Leagues in the Cordillera are making a major national breakthrough - they are booming, rapidly expanding and vigorously flourishing. 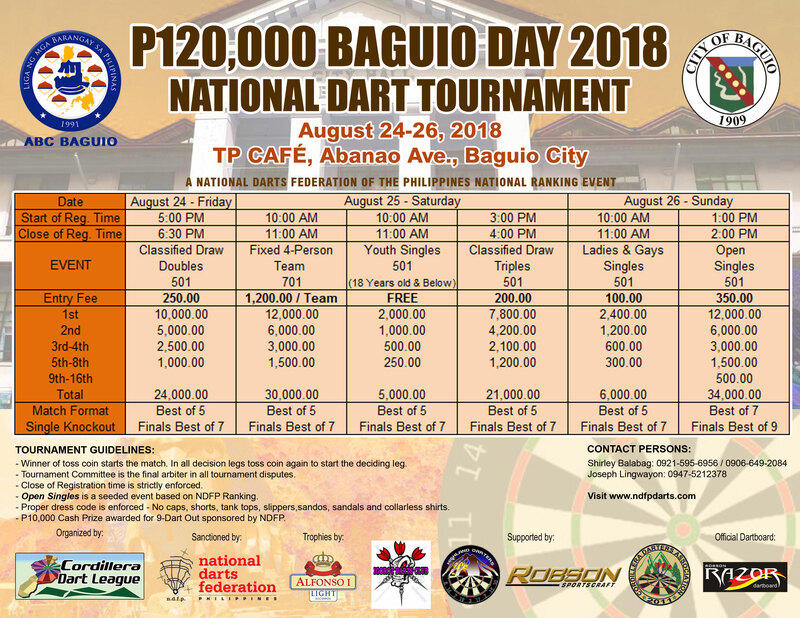 Ninety-seven (97) dart league teams with over five hundred (500) darters recently concluded the four (4) Summer Dart Leagues in the Cordillera, organized by the Cordillera Dart Leaguers, Highland Darters, and the Igorot Dart Club. 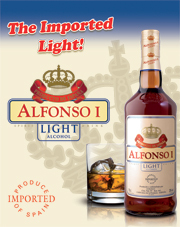 The finals and awarding were held last July with over 120 trophies sponsored by Alfonso I Light. 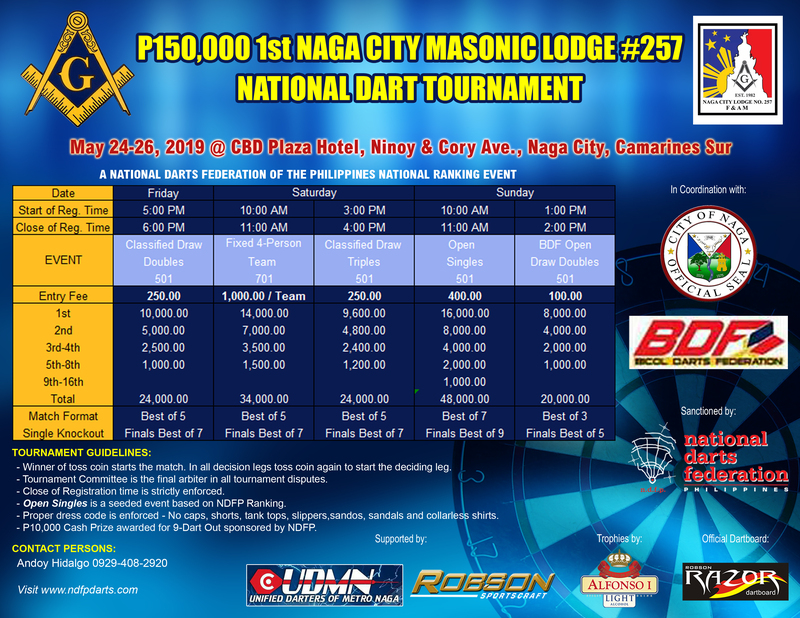 The quest for the P25,000 Chris Sports Darter of the Year Award for 2015 is wide open after 18 NDFP Sanctioned and Ranking tournaments with a total cash prize of 2.6M from January to June, 2015. 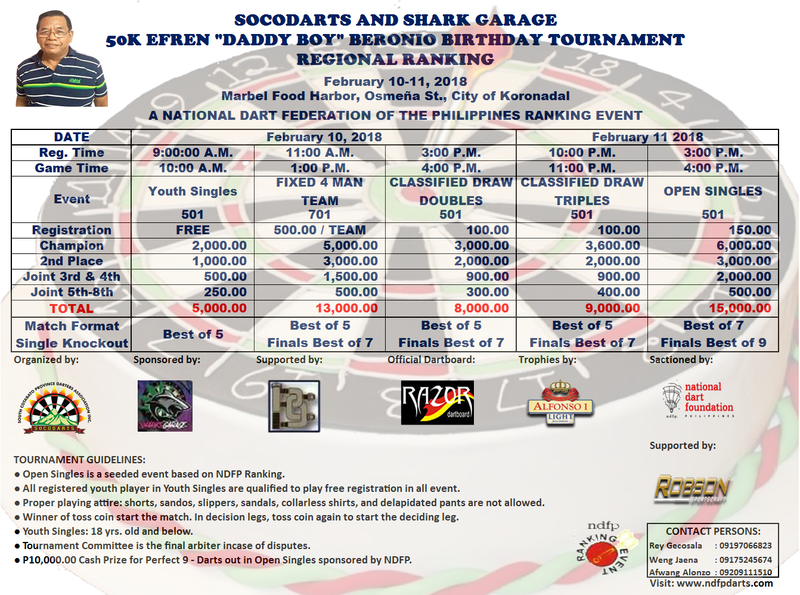 The historic 12 NDFP ranking tournaments in the 2nd Quarter Darts Ratsada greatly altered the ranking of the 1st Quarter. National Master (NM) Christian Perez retains the number 1 NDFP Player Ranking at the end of 2nd Quarter, 2015. The top 4 ranked players of the 1st Quarter remained the same for the 2nd Quarter. Prussian Arceño remained in 2nd place followed by NM Lourence Ilagan and NM Bong Gabiana. Though the ranking stayed the same, the points-difference separating the players have significantly been narrowed and changes in the 3rd quarter ranking is highly anticipated. 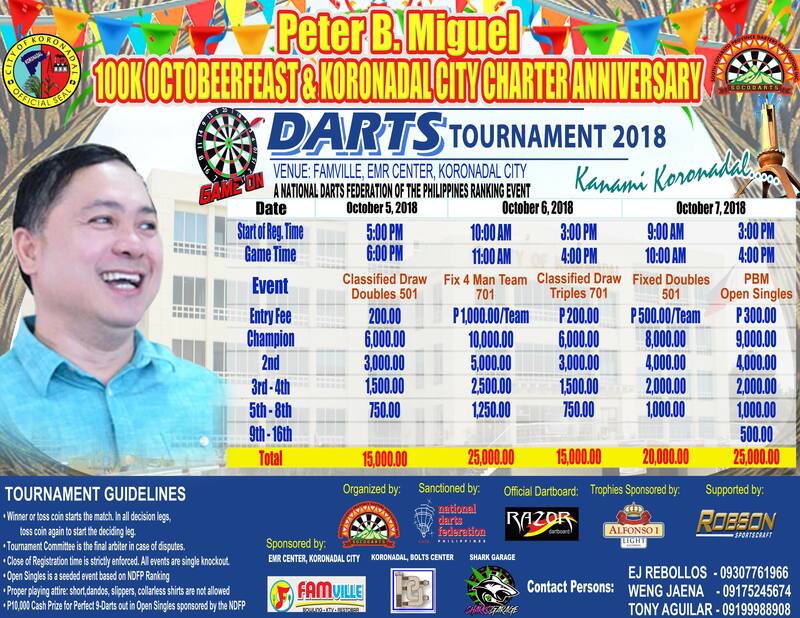 The P260K Mayor Alfred Romualdez National Darts Open was a fitting conclusion to the historic 12 NDFP Ranking tournaments of the 2nd Quarter Summer Darts Ratsada with over P1.6M in cash prize. This was the biggest tournament of the 2nd Quarter. Almost all of the Philippine top players were in attendance coming from the Cordillera to the hinterlands of Mindanao. “The Icon of Davao Darts” passed away. Bonifacio “ Boy” Gludo, succumbed to cardiac arrest and kidney failure last June 13, 2015 after a massive stroke he suffered two days earlier. Body lies in state at St. Peter, Panabo City, Davao del Norte. Interment will be on June 23, 2015 and a necrological service by darters will be held on June 20. A Special P10,000 Award will be given to the Most Valuable Player of the 250K Mayor Romualdez Tacloban Open. The MVP award will be given to the player with the most cash winnings during the 3-day tournament scheduled from June 26 to 28, 2015 in Tacloban City. In events such as the Four (4) Person Team, Doubles, Triples, and Singles, the individual cash share of each player will be added to determine the player with the most cash winnings. Ang 200K Nagcarlan Open ay handog ni JRS - John R. Solpico, at ng kanyang maybahay na si Mary Teresa C. Solpico. Sila ay katutubong Nagcarlan at matagal nang mga engineers na nagtratrabaho sa Malaysia at Thailand. Dahil mahal nila ang darts, sila ay tumutulong at nagma-manager sa JRS TEAM sa Asian Dart Circuit tulad nila Prussian Arceño, Andy Villamor, Nayr Ocampo, at iba pa. May pagkakataon din na sponsor sila ni Lourence Ilagan and company sa Hong Kong Open. Christian “The Titan” Perez successfully defended his Federation Cup title by edging Nelson “Ace” Uligan in a pulsating last dart D5 finish in the best of 7 championship match. Perez was ahead with a comfortable 3-0 lead until Uligan hit a barge of 180’s and 140’s to even the match. Uligan gained an advantage by throwing first in the decisive leg. After 12 darts, Perez has 80 left, and hit a triple 20, missed the D10 and hit the inside ten. Uligan with 75 left, hit a S17 and S18 and almost made D20. With Double 5 left, Perez hit an outside marker, wired the outside D5 and hit the game winning shot on his last dart for his 2nd consecutive NDFP Federation Cup Championship. 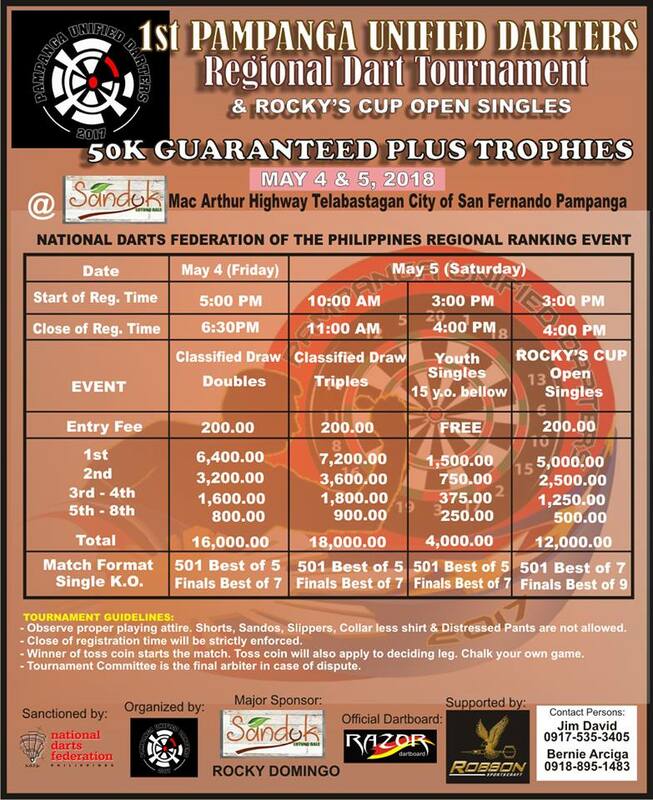 The 2nd Federation Cup of the National Darts Federation of the Philippines (NDFP) unfolds on May 30 at 5:00PM for the first Round Robin and continues on May 31 at the Sta. Lucia Mall, Cainta, Rizal. The top 32 players of the NDFP Ranking ending December 2014 are invited to the exclusive circle of the best players nationwide to dispute the honor of the Federation Cup champion - the most prestigious singles championship. The Invitational Federation Cup is a free-registration event with a total cash prize of P24,000. 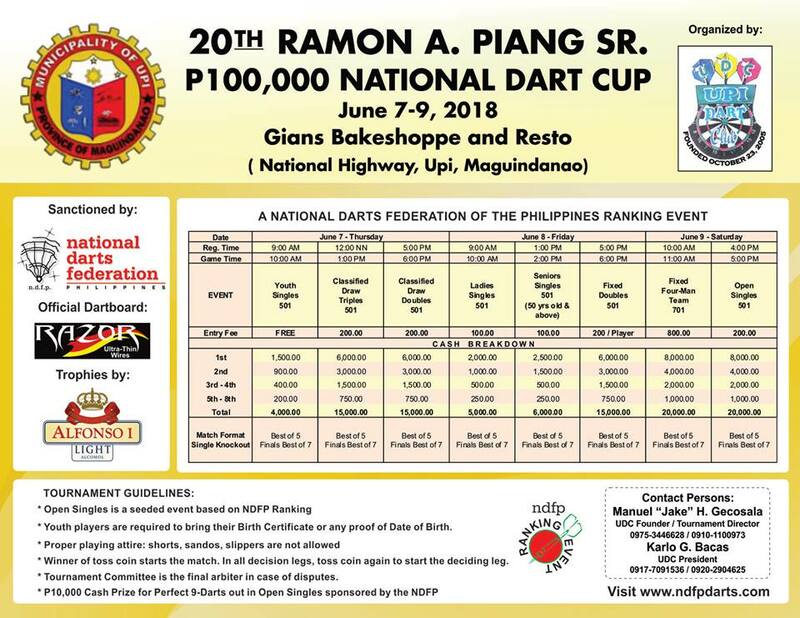 The 1.5M Summer Darts Ratsada started auspiciously with a historic win of the youngest player ever to win an NDFP Major Ranking tournament ( 100K and over). Dolreich Tongcopanon, better known as DJ of Gensan-Robson, will be 20 years old in May 2015, won the Open Singles of the recently concluded Daragang Magayon – Bicol Dart Challenge IX in Legaspi City last April 19, 2015. Awesome, intense and overpowering may be an understatement of the deadly form the Filipino dart players displayed in the recently concluded HKS700,000 11th ADA International Dart Tour, last Aril 9-12, 2015, at the Kowloon International Trade and Exhibit Center (KITEC) in Hongkong. 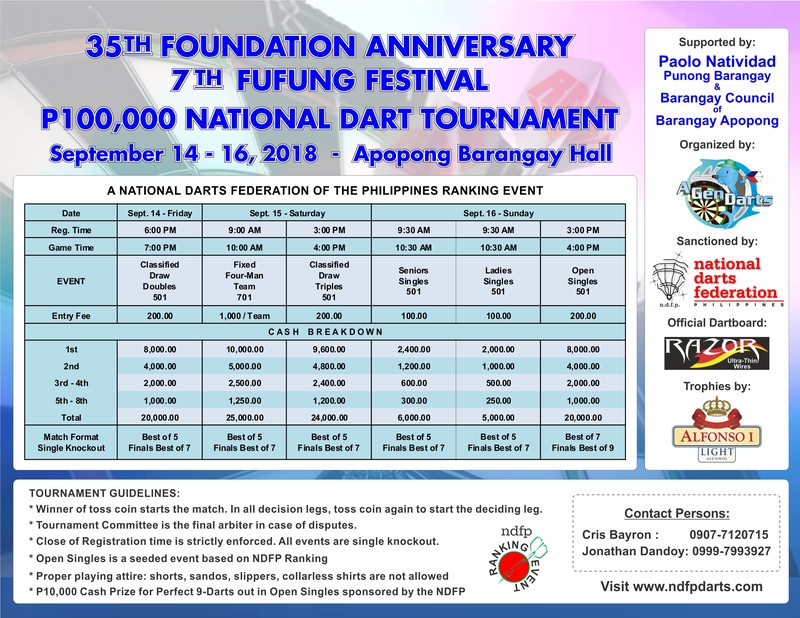 NDFP ranking tournaments - where champions are made, new talents discovered, skills sharpened, and the gateway to international fame and glory – has a total cash prize of P1.5 million in the 2nd quarter of 2015. 1st QUARTER RANKING / 2nd Quarter Schedule set. Christian Perez, the winner of the 2014 Darter of the Year Award, leads the 1st Quarter ranking for 2015 Darter of Year with 112 points. Christian earned 72 big ranking points in winning the Open Singles of the 300K Jay Harrow Cup, the biggest ranking tournament in the 1st Quarter. Christian won additional 40 ranking points with the 2nd place finish in the 150K Araw ng Dabao in Davao City. National Master (NM) Christian Perez tops the NDFP Men's Player Ranking ending the 1st Quarter of 2015 by winning the 300K Jay Harrow Cup Open Singles and a 2nd place finish in the 150K Araw ng Dabao. Rommel C. Atienza is an acoustic musician, song writer, and folk singer born and raised in Calapan City, Oriental Mindoro. Mel is also a music instructor and put up a band music studio called Rhytym and Beat in 1994 where he taught guitar, drums, and keyboards to kids and teenagers. A proud father of four, his children are all into music - skilled at playing almost all sorts of instruments from keyboards, guitar, violin, drums, saxophone, etc. Apart from his passion in music, Mel is a web designer/ developer, video editor, recording artist, graphic artist, photographer, videographer, & dart player. 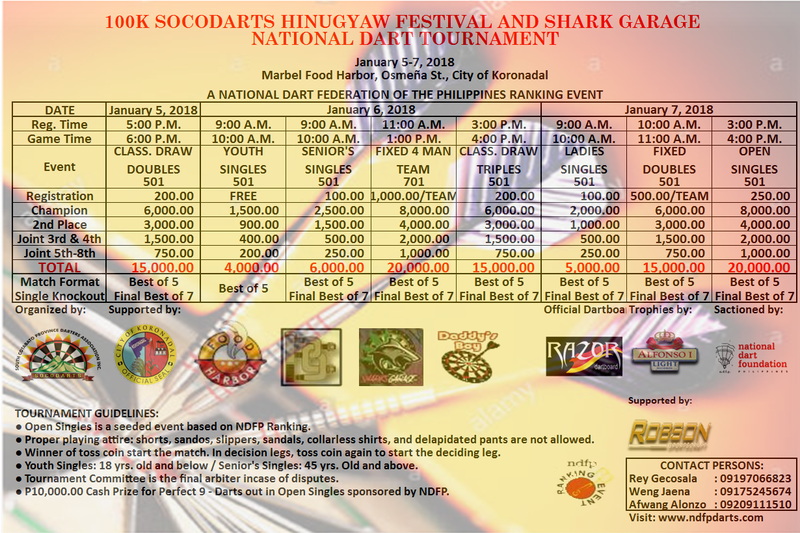 Mindanao darters dominated the NDFP Sanctioned and Ranking Tournaments from Baguio to Davao in the 1st Quarter of 2015. The P300K Jay Harrow Santos Cup was won by National Master (NM) Christian Perez of Robson-South Cotabato. NM Andy Villamor of Dominics-Bukidnon won the P150K Araw ng Zamboanga Sibugay, NM Dixie Ybañez of D'Gunner-Cagayan de Oro won the P120K Panagbenga Festival, and NM Bong Gabiana of Robson-Bukidnon is the champion of the P150K Araw ng Dabao. The sole regional ranking tournament in the 1st Q, the P50K Unang Hirit, was won by Jun Noynay of FDAMDI Davao City. 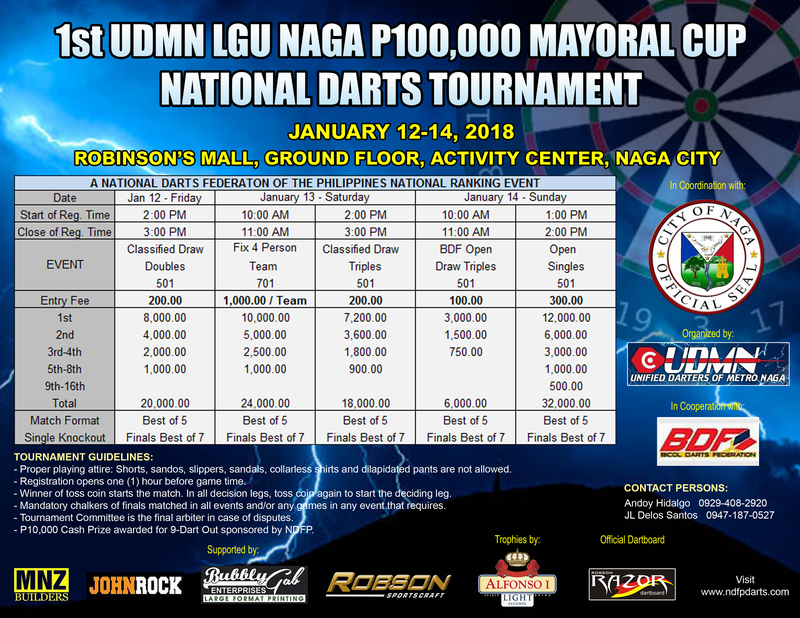 The National Darts Federation of the Philippines (NDFP) officially announces the renewal of sponsorship support from our corporate partners for 2015 - Chris Sports, Alfonso I Light, and Robson Sportscraft. The darting community and the NDFP graciously acknowledge with gratitude the continuing sponsorship support of our corporate partners in sustaining the growth and expansion of Philippine darts. 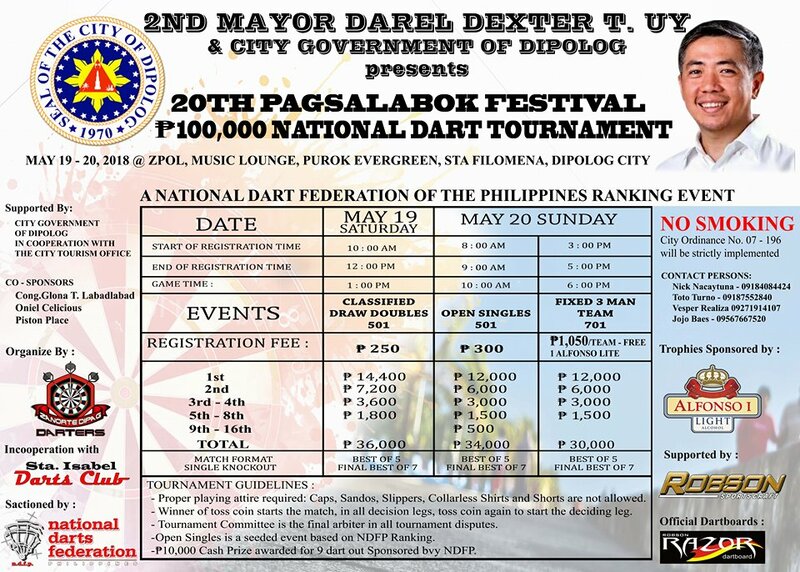 Through their support, the NDFP was able to launch innovative and inspiring programs that allowed dart players not only to excel, but to attain international recognition and bring honor and glory to Philippine darts. 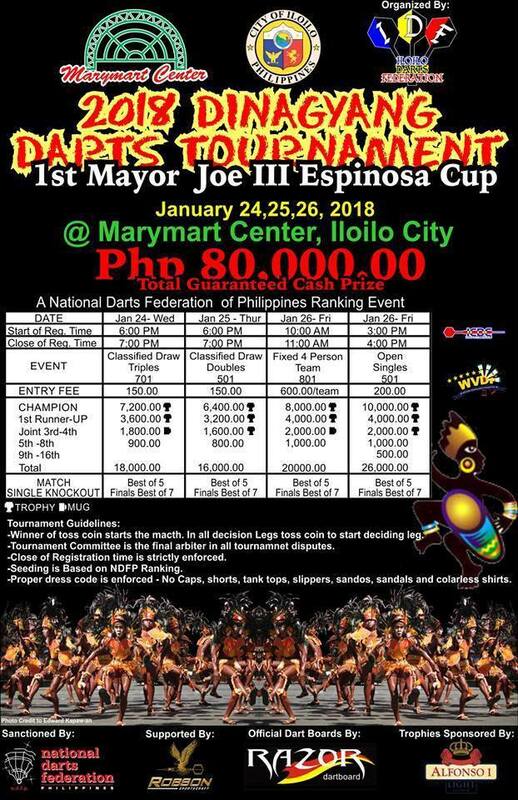 Young darting talents shined bright at the Jay Harrow Santos Cup held recently from January 23 to 25 at the Il Centro by Sta. Lucia Mall in Cainta, Rizal. Ang P300,000 Jay Harrow Santos Cup ay handog ng pamilyang Jesse at Arlene Santos sa sambayanang dartero bilang pagpapasalamat sa tinamo nilang magandang kapalaran bilang Overseas Filipino Workers (OFW). Ang paglalaro ng darts ang nagbigay kasiyahan sa gitna ng kalungkutan ng pagiging isang OFW kaya mahal ni Jesse ang darts. Year 2014 saw the significant reduction in the cash prizes won by Pinoy darters in international dart tournaments. Historically in 2013, our darters won five (5) of the eight (8) stages of Dartslive, and Lourence Ilagan won the Grand Finals championship over compatriot Christian Perez. 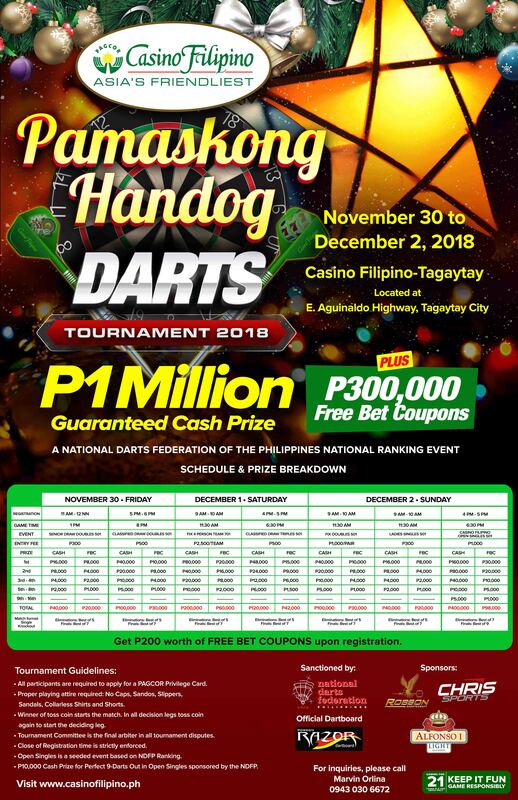 The cash prize won by all Pinoy players from Dartslive alone totaled over P10M. Aside from Dartslive, Phoenix Darts also offered big prizes taken advantage by the lot of Pinoy darters. Prussian “The Specialist” Arceño successfully gained the NDFP top ranked player distinction ending the 4th quarter and the top seeded player for the 1st quarter of 2015. Prussian earned 475 ranking points from January 2013 to December 2014. 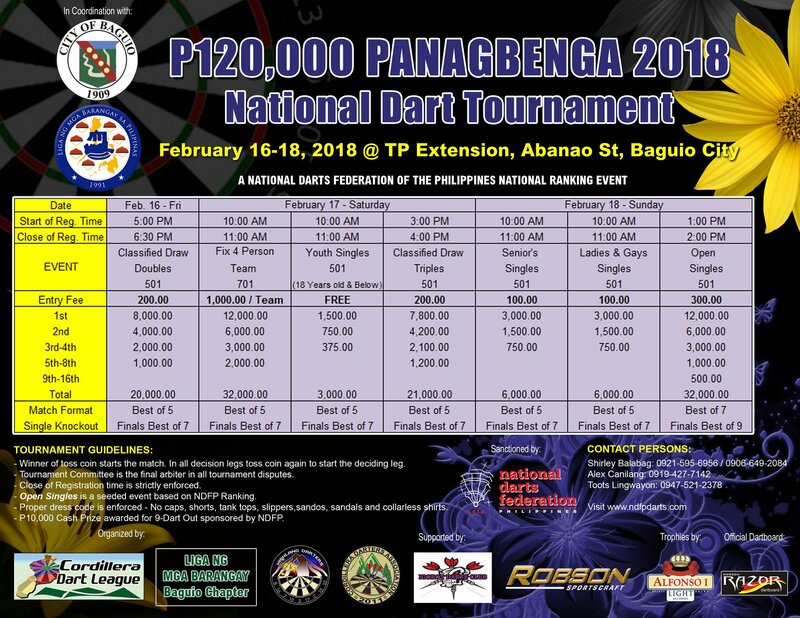 During this time, Prussian won two NDFP sanctioned tournaments: the 2013 100K Panagbenga Open, and the 100K Cordillera Dart Association 3rd Anniversary Tournament - both in Baguio City, and consistently placed in the top 8 of other major tournaments. Playing in the international tournaments greatly boosted Prussian’s confidence and sharpened his playing skills. Hopefully Prussian wins his 3rd major Open Singles championship in 2015 to become the 12th NDFP National Master. Christian Perez wins the Chris Sports Darter of the Year as Prussian Arceño fails to win enough points to overhaul the slim 31 points lead of Christian Perez. 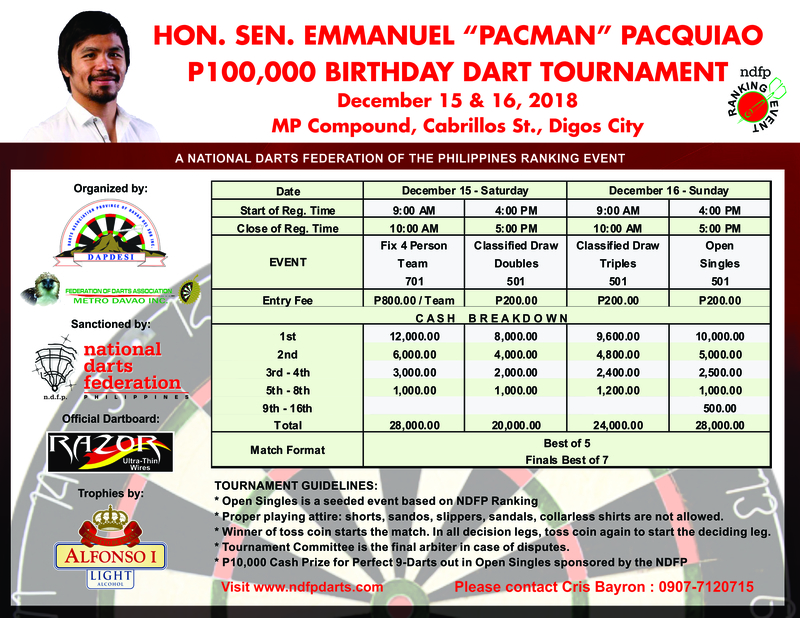 Going to the final 2014 NDFP ranking tournament, the 1M Congressman Manny Pacquiao Philippine Darts Open, Prussian Arceño only needed 32 ranking points, with the absence of Christian Perez, to win the Darter of the Year Award. Christian Perez skipped the 1M Manny Pacquiao Tournament as he left for London for the World Darts Championship on the day the Open Singles was played. The schedule for the William Hill World Darts Championship was released today. Christian Perez, the leading player for the Darter of Year plays on the first day (December 18) at the World Darts Championship in Alexandra Palace, London. The visa for UK was approved December 2 and the flight bookings were finalized today. His flight to Manila from GenSan is on December 14, leaves Manila on December 15, and arrives in London on the afternoon of December 15, giving him enough time to shed the jet lag. 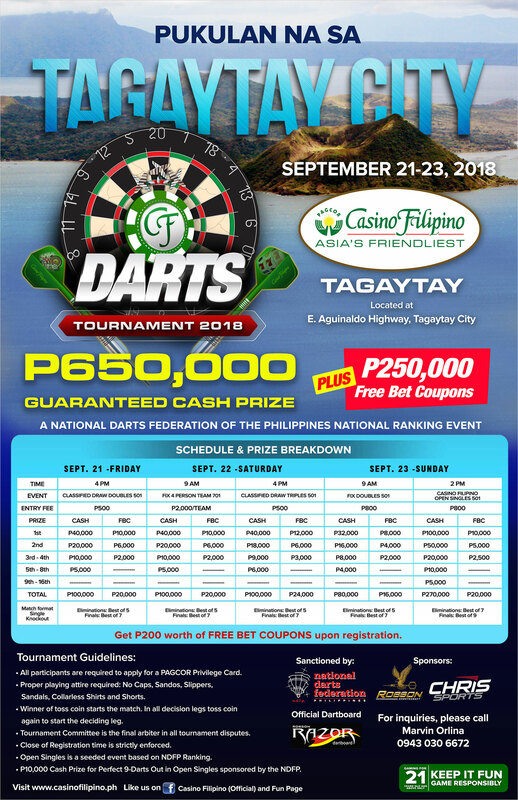 With no problems in the travel arrangement - there will again be a Filipino player in the global stage of the biggest and most prestigious dart tournament of the world - the William Hill World Championship. Congratulations, Lourence “The Gunner” Ilagan, champion of the MSDO 2014 Grand Master Championship in Selangor, Malaysia last November 16, 2014. Ilagan won the finals against world renowned Singapore legend Paul Lim in a decision game. Christian “The Titan” Perez of Robson, Koronadal City, regained the top NDFP Player Ranking at the end of the 3rd Quarter 2014. Perez played in five (5) championships out of the seven (7) ranking tournaments in the 3rd Quarter, winning the Peñafrancia Open in Naga City and a losing finalist to Bong Gabiana twice. Andy Villamor slid into second place with only a win in the T’nalak Festival. Prussian Arceño of Dominics, Manila maintained 3rd place with consistent top 8 performances. 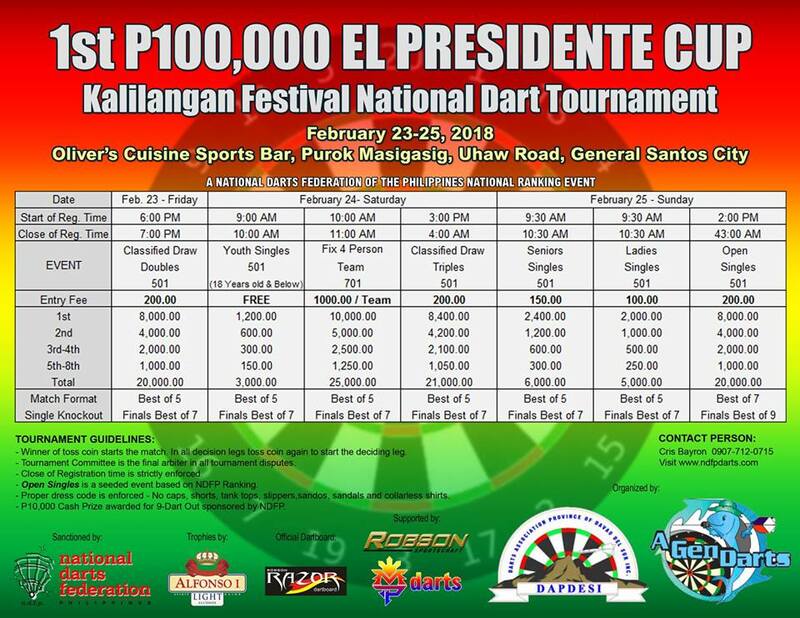 The National Darts Federation of the Philippines expands its advocacy and influence to the Filipino darting community in the Independent State of Papua New Guinea through the affiliation of the Pinoy Darts Club of Papua New Guinea. 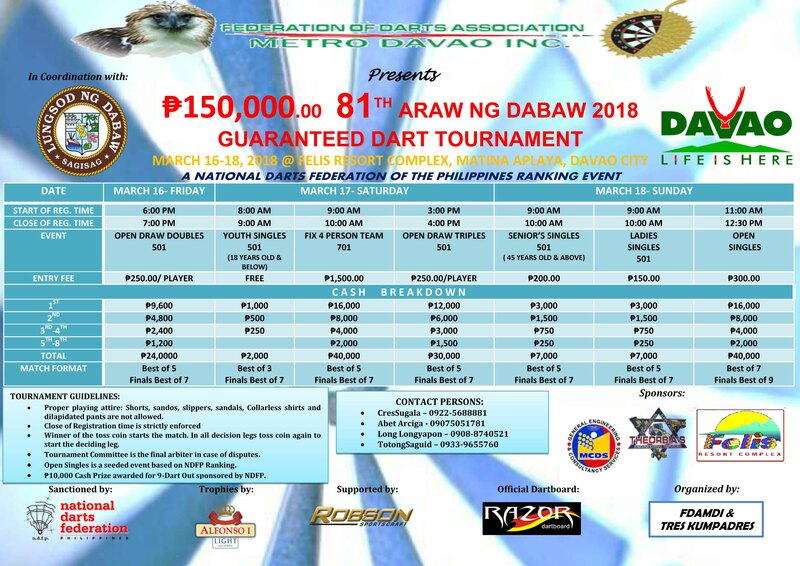 The P15,000 Inter-City4-Person Team event of the Darterong Pinoy is an invitational team event open only to NDFP affiliated dart organizations to represent their cities or municipalities. The event will be played simultaneously with the traditional Open 4-Person Team event on October 18, Saturday. 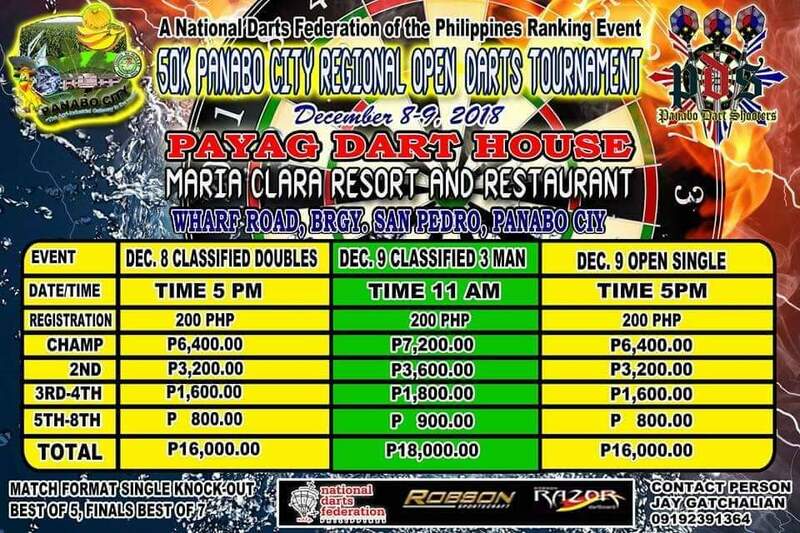 The total cash prize for the FREE-REGISTRATION DARTERONG PINOY 2014 is now at 150,000. 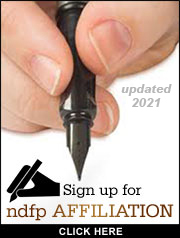 The NDFP is increasing the cash prize from the previously announced 120,000 to accommodate two additional events. No less than The Titan said it. On the last and final day of TSADarts Episode III, Ian Perez did not play in the 3-Man Classified Draw. He rested the whole morning. He wanted to come prepared in the afternoon for the tough games in the Singles event. So did other national darters like Boie Parfan, and Prussian Arceño. You know why? Because this is Cagayan De Oro. This is the place where the hunters (localspeak for accurate and deadly darters) give the so-called glamour darters of Manila headaches and heartaches on the boards. Almost always. Congratulations Rolly “Bong” Gabiana, of Robson Bukidnon, the newly crowned NDFP National Master. 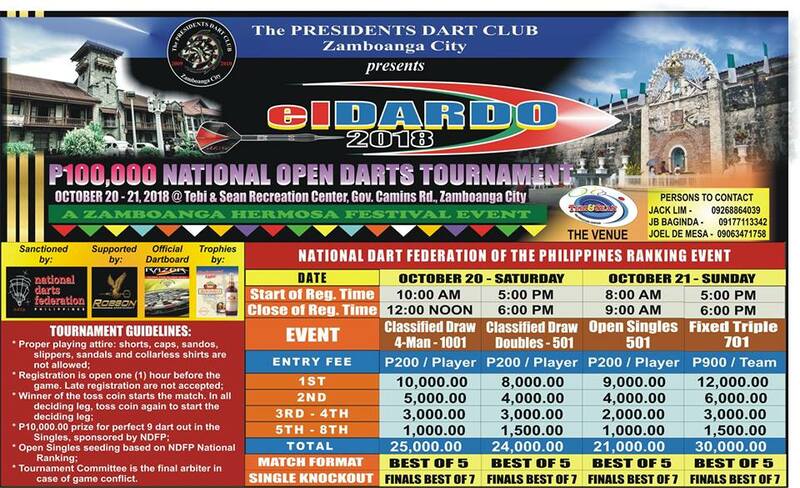 Gabiana attained the NDFP National Master norm of three (3) National Singles Championships by winning the Open Singles of P100,000 TSA Darts Episode III in Cagayan de Oro City, the P130,000 29th Kadayawan in Dabaw 2014, and the P100,000 Gov. Mercado Cup, Maasin City. This is a record breaking feat winning 3 out of the last 4 national open singles in two (2) months. MSC, the Montalban Shooters Club won the championship of the recently concluded Marikina Dart League by a score of 7-5 over the reigning Villa Veranda league champions Bodega Boyz of Marikina City. In 3rd place is Team Bacham of San Mateo, Rizal prevailing over Try Lang of Marikina City. The league started with 20 twenty teams coming from Montalban, San Mateo, Taytay, Marikina, Pasig, and Quezon City. The 2014 Robson Summer Dartfest did not produce the much hope for a head to head showdown between two of the finest darters in the land today - The Gunner vs The Titan. Nonetheless, the 3-day event brought exciting and closely fought matches. After the smoke has cleared, Lou won 2 events – Classified Doubles and the Open Singles, while Ian bagged the first Federation Cup crown. This left the Pinoy darting nation hanging dry once again and aching to see more of these two great gladiators battle mano-a-mano with each other in the tournaments ahead. 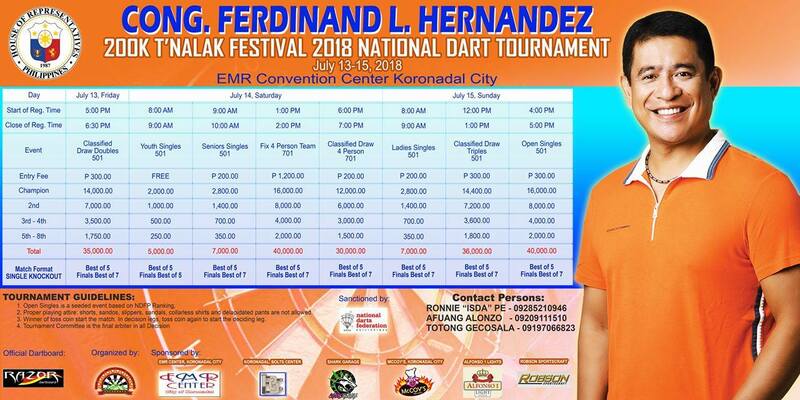 Andy Villamor, the newly installed NDFP National Master, leads the ranking for the P20,000 Chris Sports Darter of the Year Award after winning the 150K Bicol Dart Challenge and placing 5th-8th in the 200K Robson Summer Dartfest and in the 100K Gov Mercado Cup. The Darter of the Year Award is given to the darter with the most NDFP ranking points earned from January to December of 2014. The ranking points are based on the number of participants in the Open Singles and on the total cash prize of the ranking tournament. 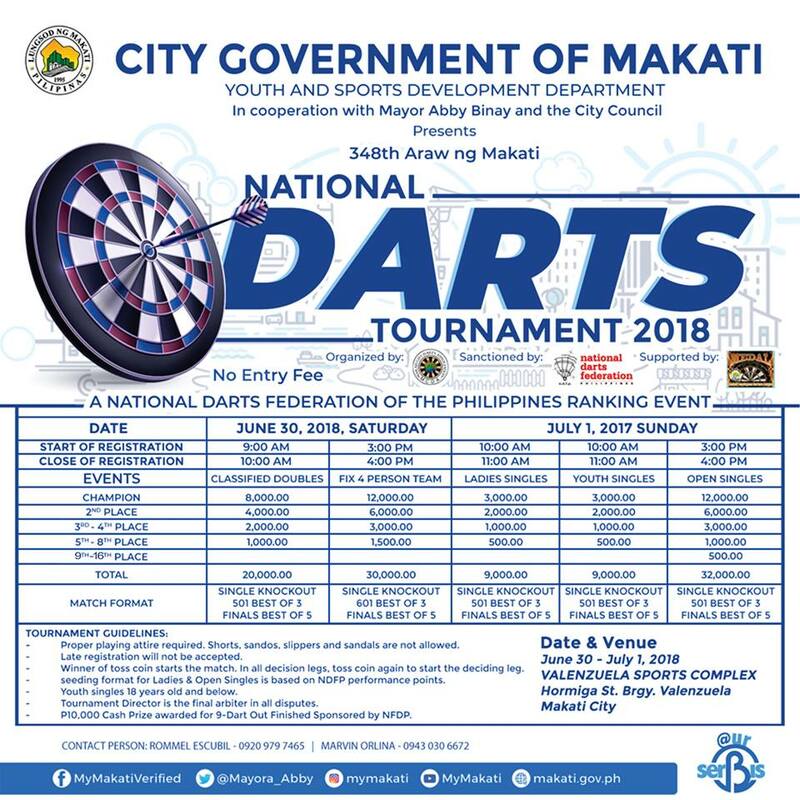 The National Darts Federation of the Philippines (NDFP) would like to express its grateful appreciation to the overwhelming support of the darting community – the players, the managers, the local dart associations, and the local government units in the recently concluded Robson Summer Dartfest. The player registration was beyond our expectation. The 2014 Robson Summer Dartfest lived up to expectations from the pre-event series of teasers and come-ons which centered on “cool, spacious, fun, friends, family, inspiring, challenging, and world class”. 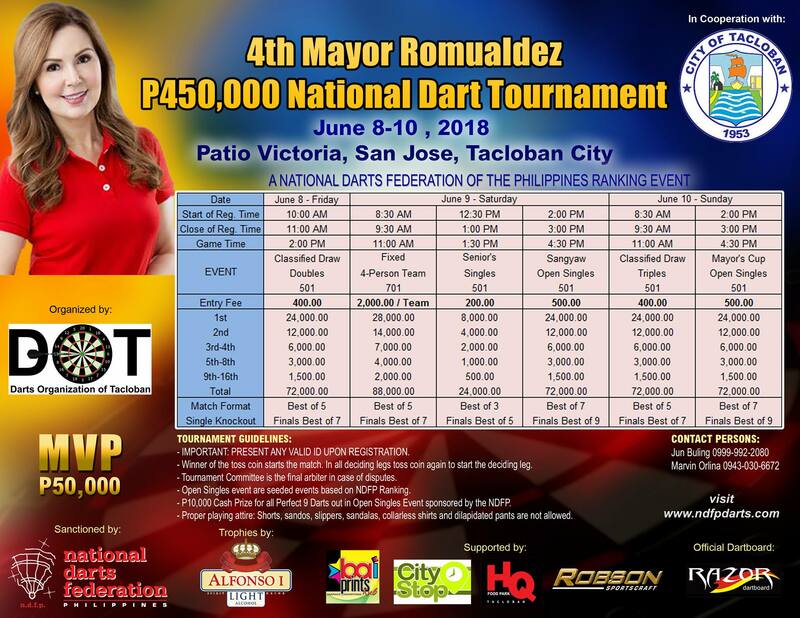 The Robson Summer Dartfest, organized by the National Darts Federation of the Philippines (NDFP), was held from May 30 to June 1, 2014 at the Sta. Lucia Mall, sponsored by Chris Sports, Alfonso I Light, San Miguel Beer, Coca-Cola, Grip-X, and Food Island. Umuusok ang balitaktakan hingil sa nagkasabayang mga torneo. Noong una pa malinaw na ang pananaw ng NDFP sa bagay na ito at lumabas na sa mga pahina ng pahayagan noong 2008 pa, sa Dartero Korner ng Tumbok. Congratulations Andy Villamor, the new National Master. 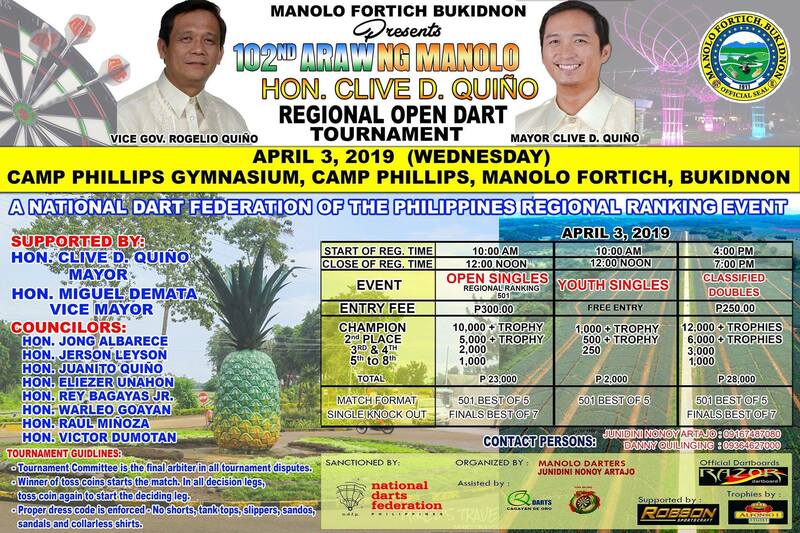 Villamor, the NDFP #1 ranked player, won the Open Singles of the recently concluded Magayon Festival- Bicol Dart Challenge VIII for his 3rd major tournament championship, thus becoming the 10th member of the elite NDFP National Masters. The Magayon Festival – Bicol Dart Challenge VIII, organized by the Darterong Albayano last April 10-12, 2014 in Legaspi City saw the participation of the top Philippine darters showcasing an overwhelming display of precision, consistency and mental maturity exceeding the high standards of darts the Filipino players are known for. And with the recent trip to Malaysia, Hongkong and Macau, our top players were more than prepared, they were razor sharp. 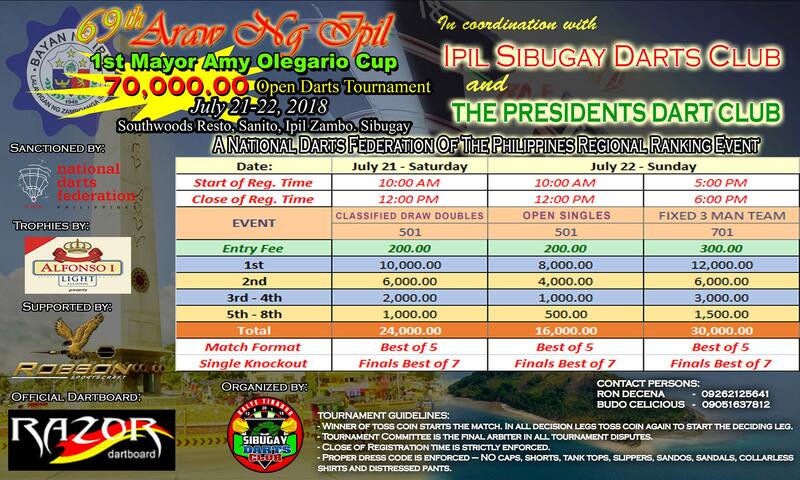 The National Darts Federation of the Philippines (NDFP) launches the 2014 Invitational Federation Cup with a total cash prize of P24,000, scheduled on June 1, 2014 (Sunday), 10:00 AM at the Sta. Lucia Mall, Cainta, Rizal. 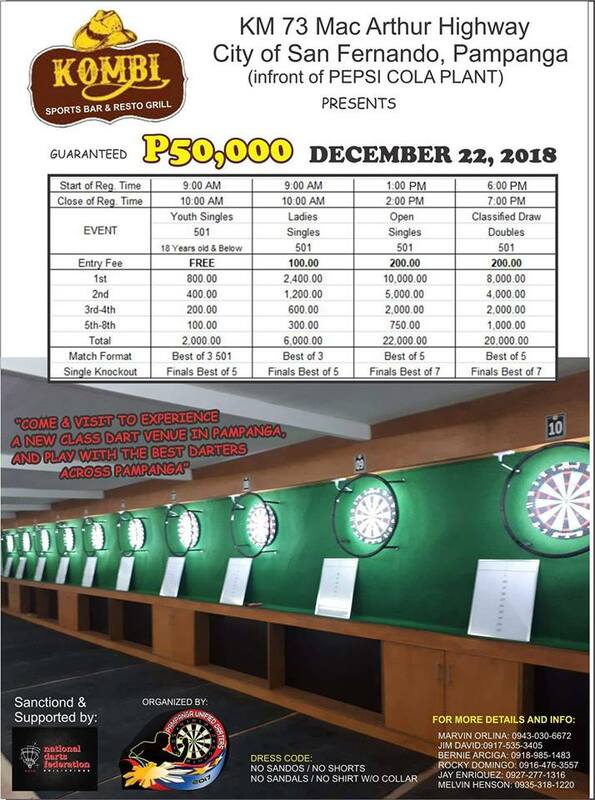 The NDFP Federation Cup is an invitational free registration singles dart tournament exclusive to the Top 32 NDFP Ranked Players ending December 2013. This is in recognition to their outstanding player performance in NDFP Ranking Tournaments. The NDFP Classified Player List will be updated in the NDFP website every quarter. This is the simplified reference list for all classified events in all NDFP sanctioned and ranking tournaments. What is the Classified Player list and why is there a need for this list? Understanding the Philippine Event formats will provide a better appreciation of the function and role of the Classified Player List. The NDFP sanctioned ranking tournaments are composed of multiple events and are mainly categorized into Open and Restricted Events. The Open events do not have any restrictions and anybody can play irrespective of expertise, talent, gender, and age. The growth of Philippine darts continues to explode as never seen before. From the depths of extinction in 2001, darts has slowly risen by bits and pieces, till 2007, where the phenomenal growth started to take off culminating in what we are seeing today. We are reaping today the fruits of darts transformation in outlook, values, beliefs and principle aided by the new realigned entities in support of these changes. We cannot go back and reassert the failed system of the past lest history repeat itself. New realities have emerged and the darting community needs to adapt and co-evolve with these changing realities. 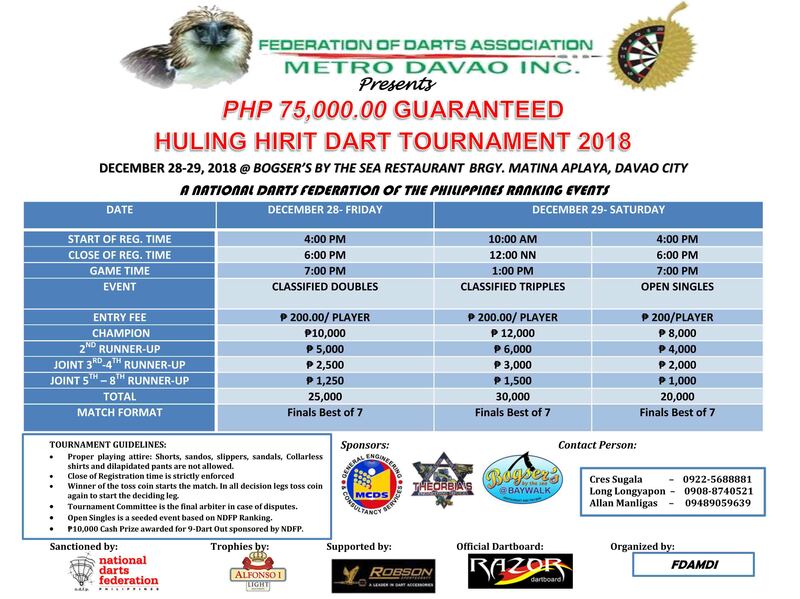 Congratulations Alexis Toylo for hitting a perfect 9-darts out in the recently concluded NDFP sanctioned “120,000 Huling Hirit” organized by the FDAMDI (Federation of Darts Association Metro Davao, Inc.) last December 27-29, 2013. The 9-darter came from hits of T20-T20-T18 (174) leaving 327 left, followed by T20-T20-T19 (177) and with 150 left, shot T20-T18-D18 for the 9 darts out. It was a non-traditional set-up, but it is was perfect. A perfect 9 darts out without a ton 80 – only in the Philippines. The NDFP once again sets in motion its Darts for a Cause commitment. The NDFP is raising funds to help support the victims of super typhoon Yolanda. More than being darters, we believe in the social responsibility and moral obligation to extend a helping hand, in our own limited capacity, to the human tragedy inflicted by the devastation of typhoon Yolanda. In this regard, we are donating all the entry fees of the Alfonso Dart Circuit of November 12, 2013, pooling the generosity of our corporate partners Robson and Alfonso I Lights with P10,000 donations each. We are looking forward in the next ten days to the response on our appeal for compassion from the nationwide dart organizations and organizers, venue owners, dart players and managers. All pooled funds will be deposited to the account of the GMA Kapuso Foundation by November 22, 2013. We thank you in advance. 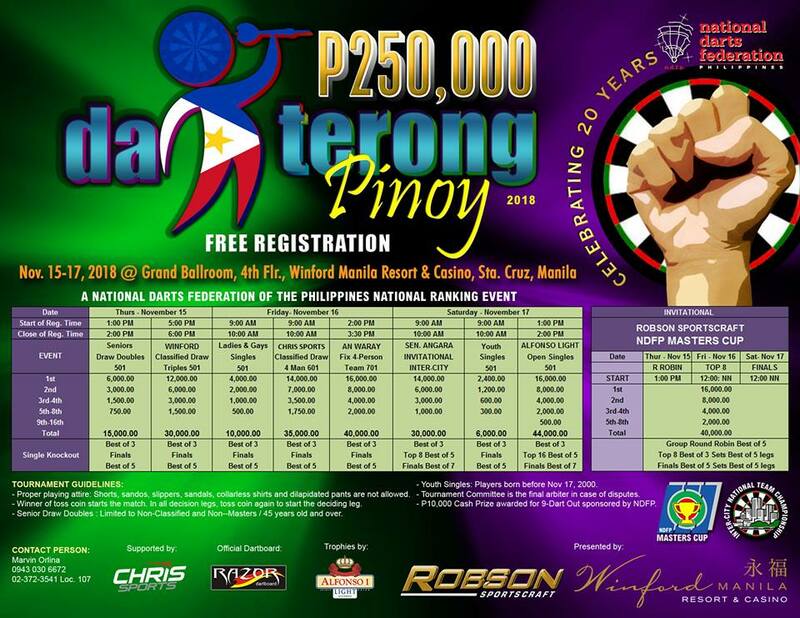 The National Darts Federation of the Philippines (NDFP) created another milestone in the history of Philippine darts with the smashing success of its organized 150,000 Free Registration Darterong Pinoy 2013, held October 11 to 13 at the Sta. Lucia Mall, that gathered a total player registration of 2,587 coming from 1,264 players, nationwide - amidst the inevitable challenges of nature and concurrent international tournaments. 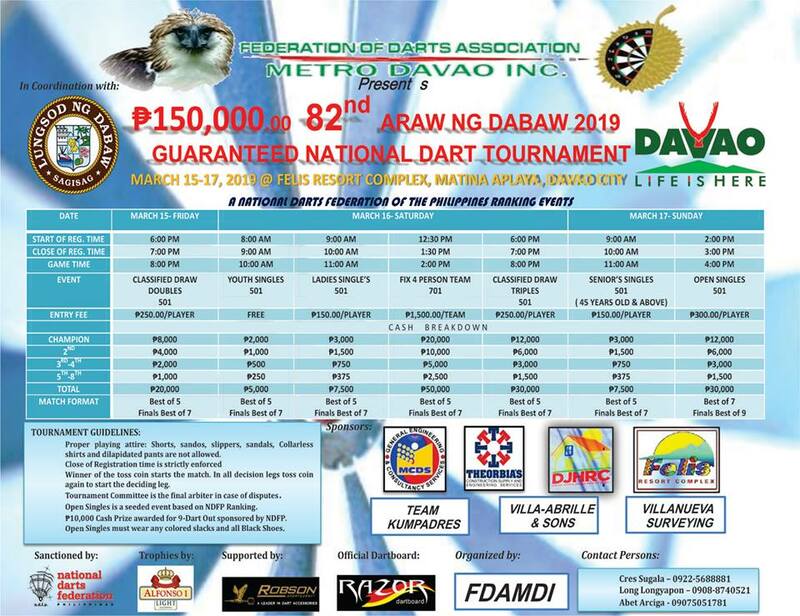 Darterong Pinoy in 1998, was the first dart event organized by the National Dart Foundation of the Philippines. It introduced multiple events in one day, single knockout format in all events and the seeded format in a major tournament, all standard practices today. The National Dart Foundation of the Philippines is in itself already an institution. Its goals and profound achievements can never be surpassed nor denied. It has shifted traditional and divisive approaches to dart development through a proactive and more holistic way of building a strong foundation and community of darters. 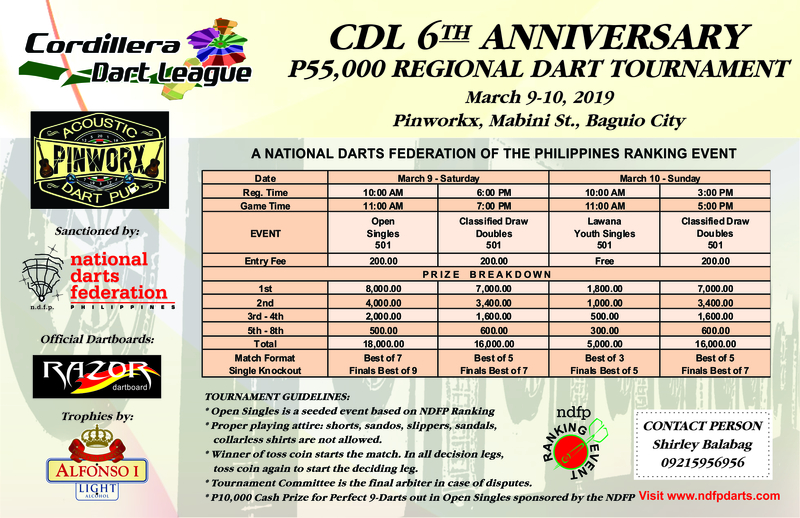 Copyright© 2013 www.ndfpdarts.com All rights reserved.